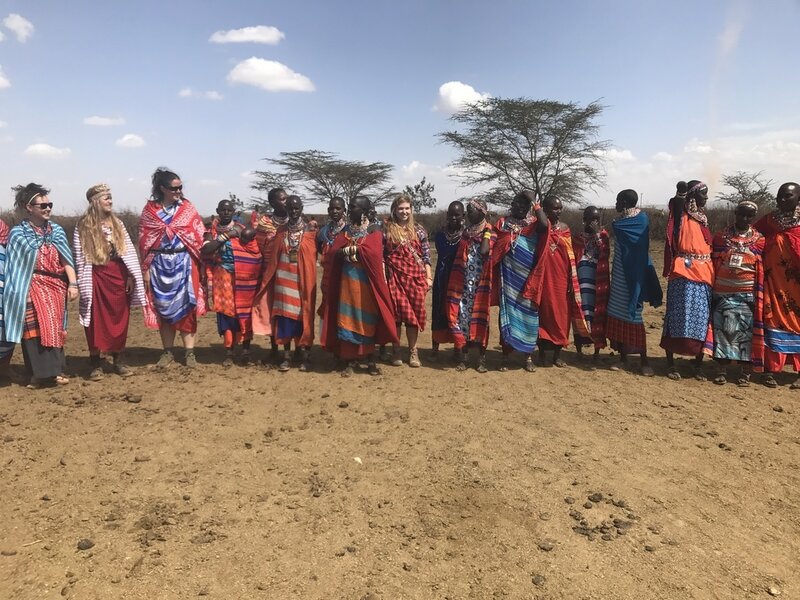 This afternoon we had the opportunity to participate in a traditional Masai wedding. 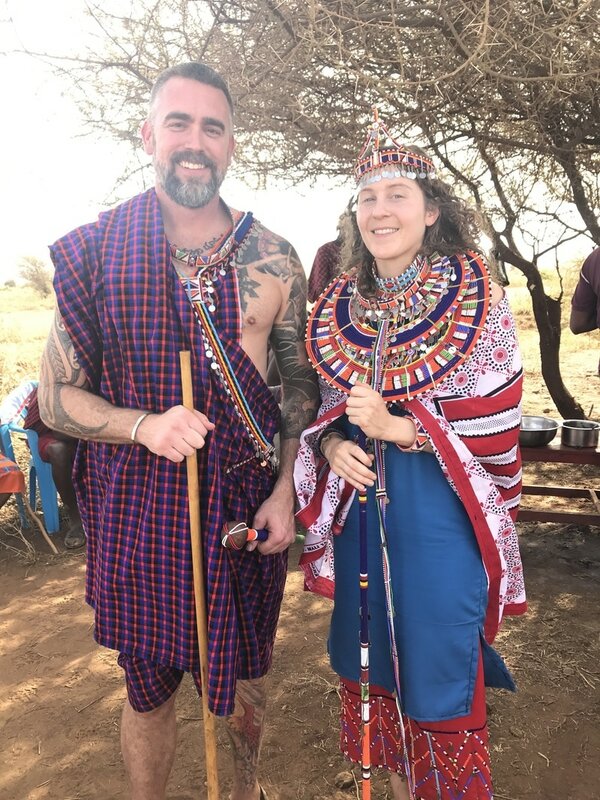 The couple, Andy and Leah, have already been married in the U.S. but had been given the opportunity to have a Masai wedding as well. 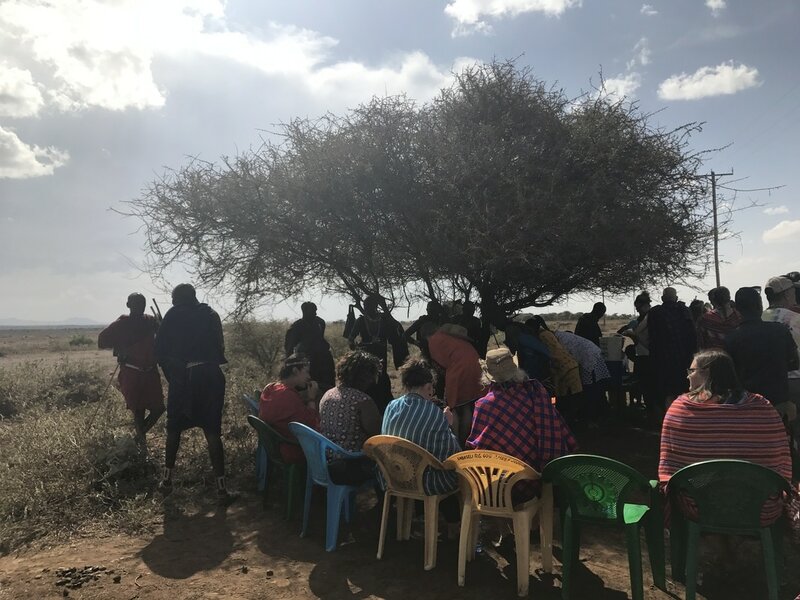 The wedding took place out in Olasiti, a boma about 2 hours away from our campus. 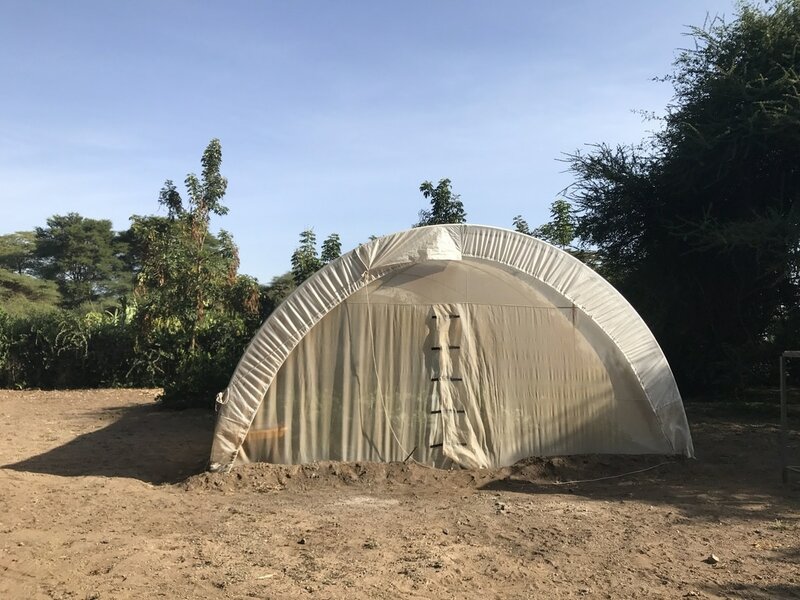 This is the same boma that will be raising the cattle and goats that we purchased in the market a few days ago. 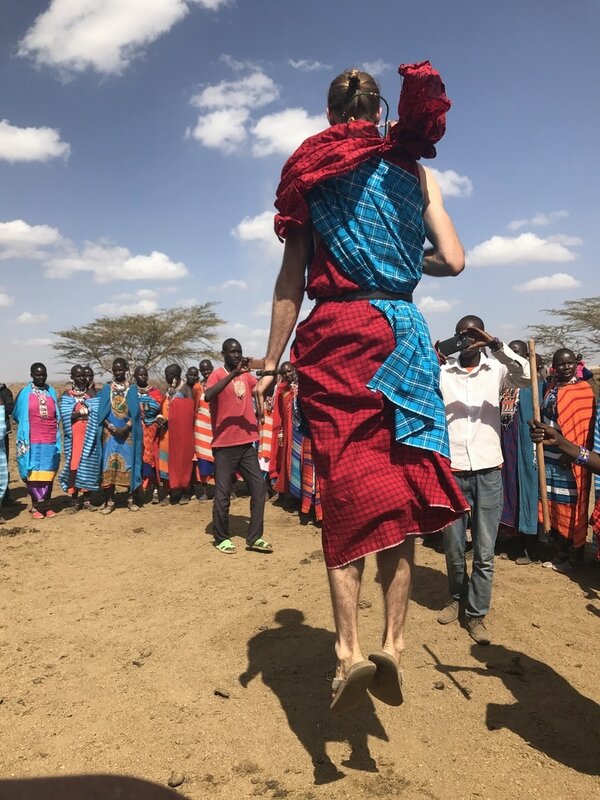 The outfit I'm wearing is made from a traditional Masai cloth called a "chukka". When looking through the market a few days ago, this one stood out to me because it looked authentic. Well, I was right about it being authentic, but there was a catch...It turns out that this is the chukka that the old men in the tribe wear...oops! 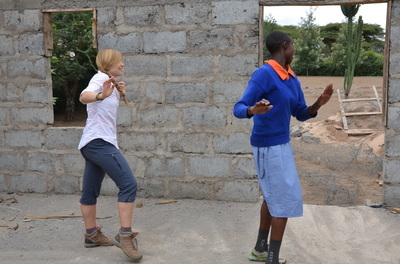 I got a couple laughs from the children and teenagers out in the boma for dressing like an elder. The jewelry that I'm wearing is both new and old. 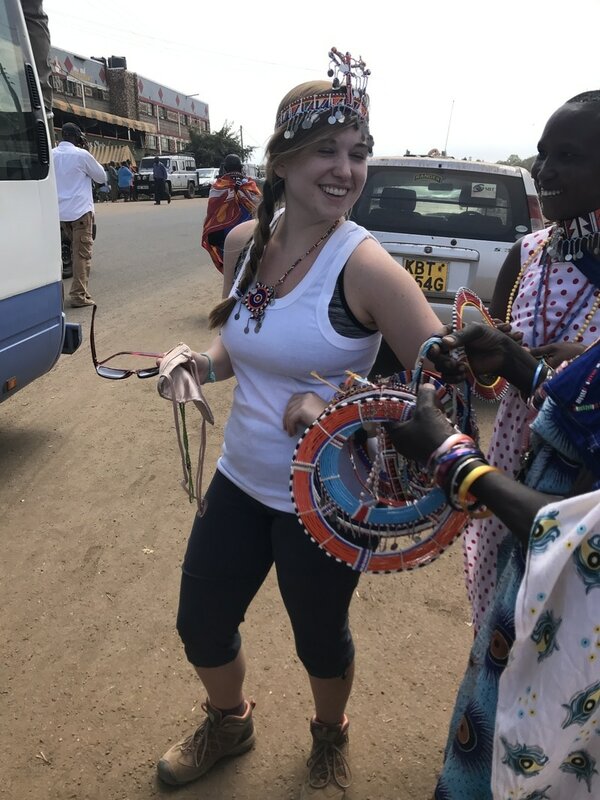 The circular necklace and cross body beads I purchased on this trip, but the beautiful beaded sash was my grandmother's. 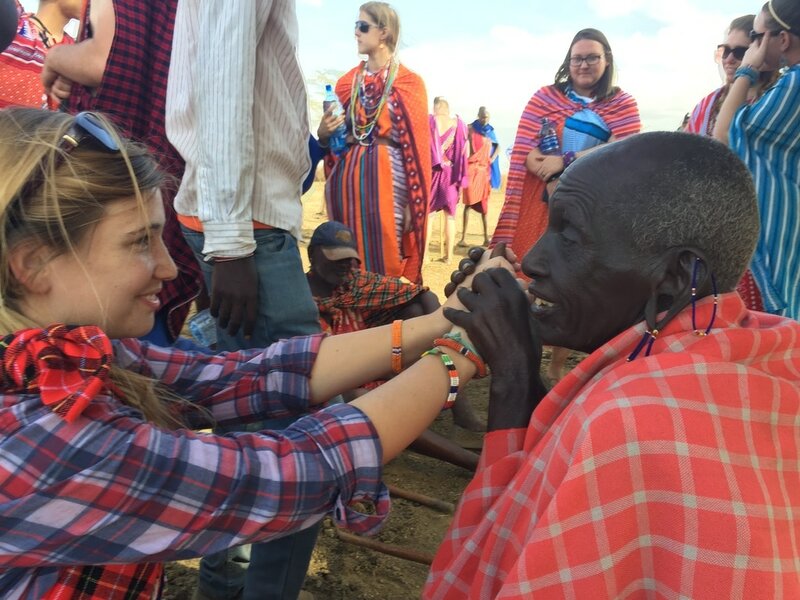 It was given to her as a gift many years ago from a Masai woman. The sash symbolizes celebration for special occasions. The picture above was taken right before we began the ceremonial dance. Two by two or three by three, groups of women jump forward while chanting. It was so cool to be a part of! 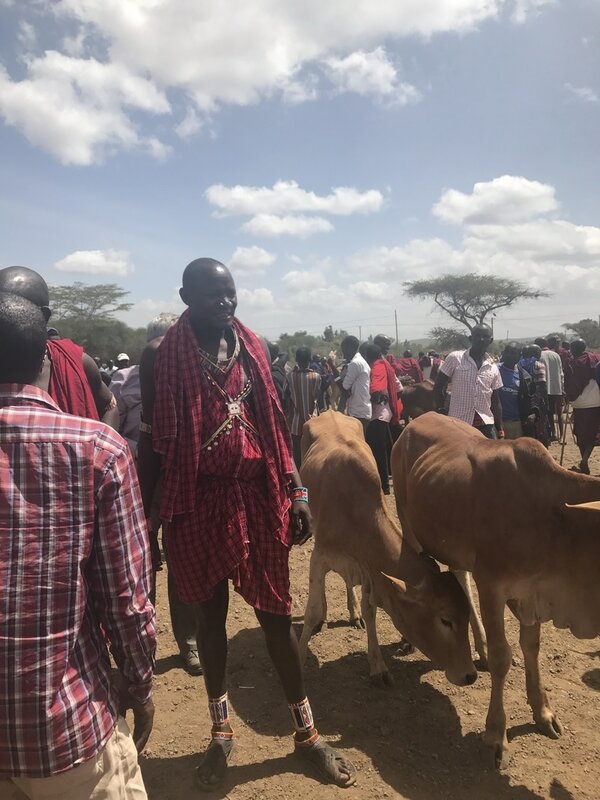 The picture to the right was taken during the blessing of the cattle. The little boy with his arm around me is named Dion. We became buds for the day, he did not leave my side! The bride and groom. Way cooler than American wedding clothes! 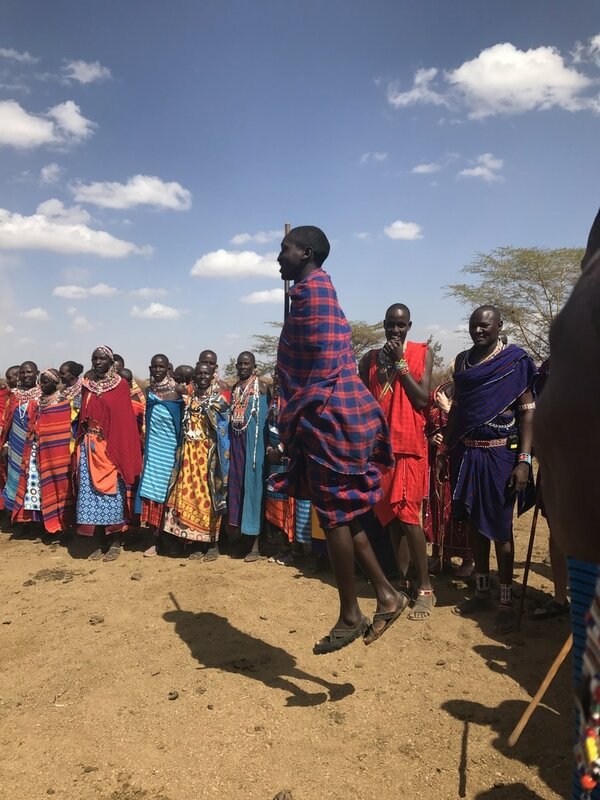 As a Masai tradition, the men present themselves in front of the women and display their jumping skills. The man who jumps the highest is considered the most attractive and is said to draw in the most attention from the women. 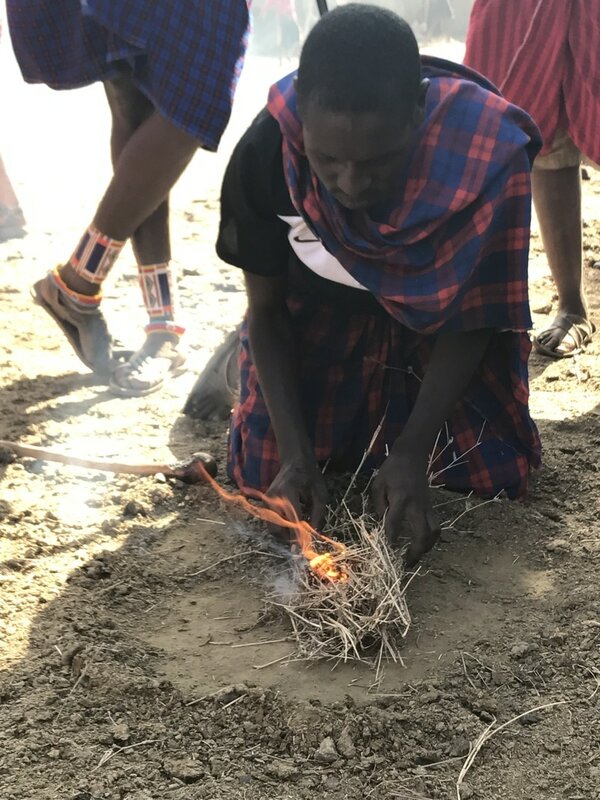 Learning how to make fire in the boma! It's essential to their survival out there. This is what a house looks like in the boma. The manyatta (house) is made of cow dung and sticks. The mamas spend countless hours building and perfecting their homes and take great pride in them. Last year, I had the opportunity to go inside of one. Needless to say, it did not smell great! But you get used to it. After the wedding ceremony, we followed the chief out to the "dining room". The men had prepared a delicious meal of rice, vegetables, bread, and the goat they had slaughtered earlier. It was my first time eating goat...Don't think I'll be eating it again but I'm glad I tried it! 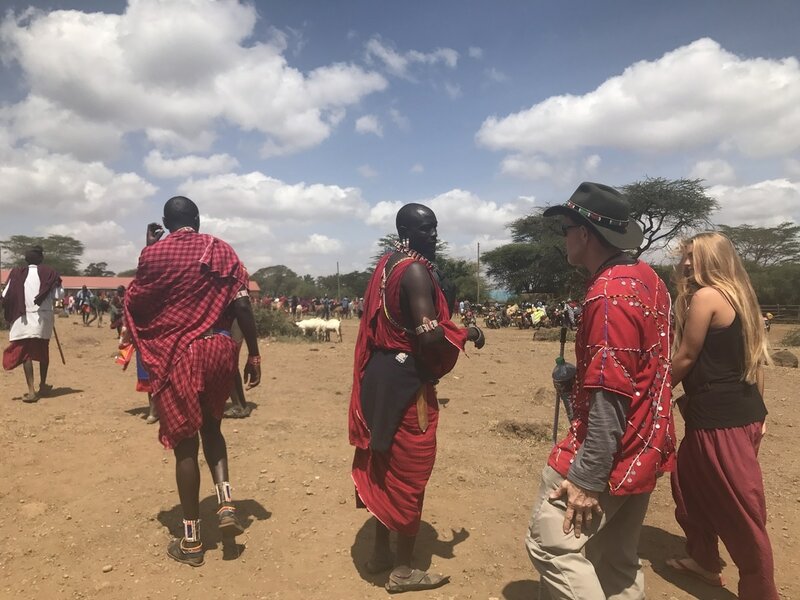 The chief's father, Moses, is the oldest man in the boma at 90 years old. It was such an honor to have him bless me. I had no idea what he was saying, but it was an awesome experience, one that I will never forget. Casual lion spotting on the way home. 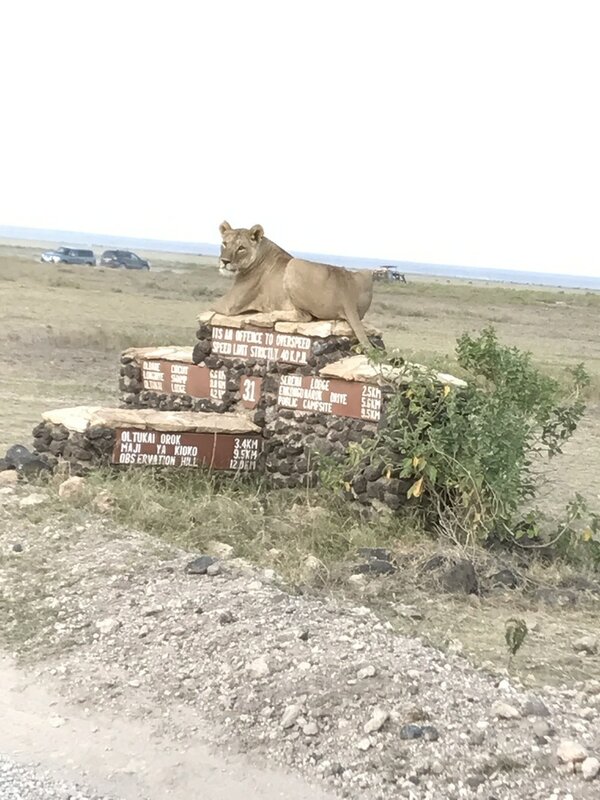 This gal was perched up on top of the road sign on display. This afternoon we visited the children at Teule orphange. Today's experience was the highlight of my trip so far. The children were loving and sweet and welcomed us with beaming smiles on their faces. Despite the hardships and trauma they have endured, these children shined from the inside out. I noticed that in contrast to the children we visited in the boma yesterday, the kids at the orphanage had more of their basic needs met. In addition, they seemed to have higher level needs being fulfilled, like affection and belonging. 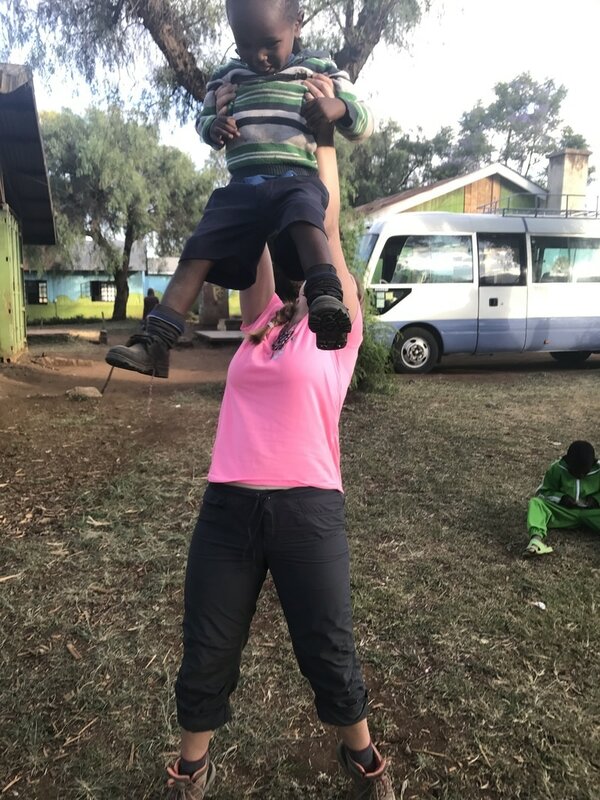 It seemed to me that because of this, the children at the orphanage were able to form more genuine relationships and connections with our group of volunteers. It wasn't about what we were bringing or what resources we had to offer, but rather what experiences we could create with them. 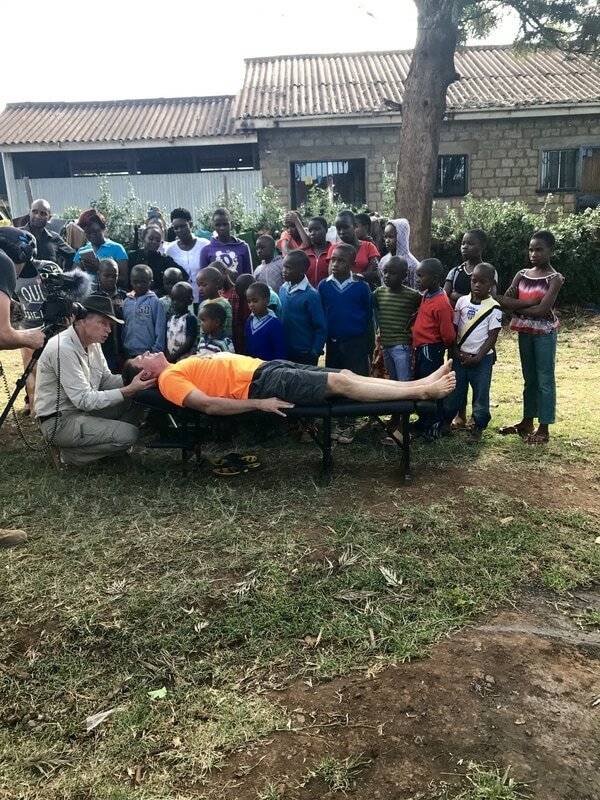 To get the children comfortable with being adjusted, we had them observe John, the director of the orphanage. John was born in the U.S. but moved to Nigeria as a kid. 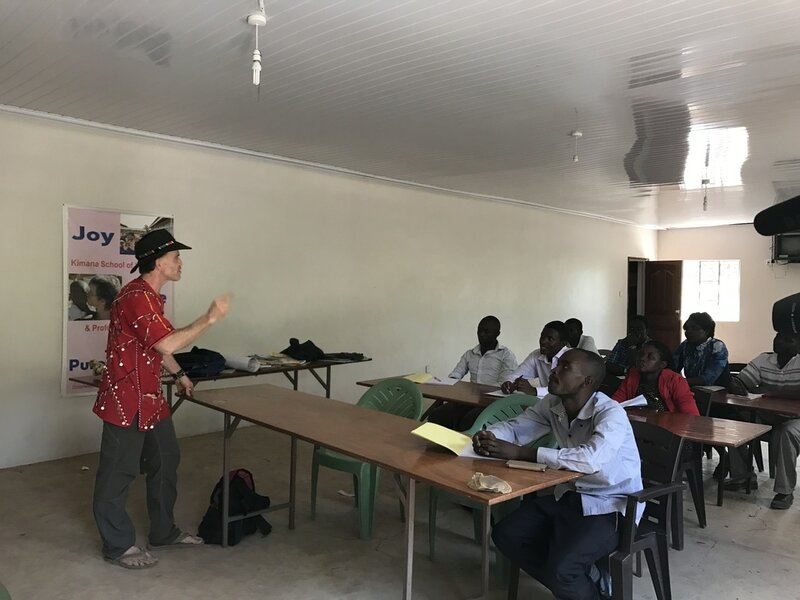 Several years ago, he moved to Kenya and began the Teule orphanage in Kimana. John is like a father to all the children. In fact, all the staff treat the children with the same love and affection as a parent. As soon as I stepped off the bus, this little cutie caught my eye. Several minutes later, Martin approached me and subtly grabbed my arm. He stayed by my side for several minutes before stepping in front of me and reaching up, as though he wanted to be picked up. One toss in the air turned into about 50 and before I knew it I was exhausted! Martin stayed by my side all afternoon, whether it was holding my hand, sitting in my lap, or being tossed in the air. 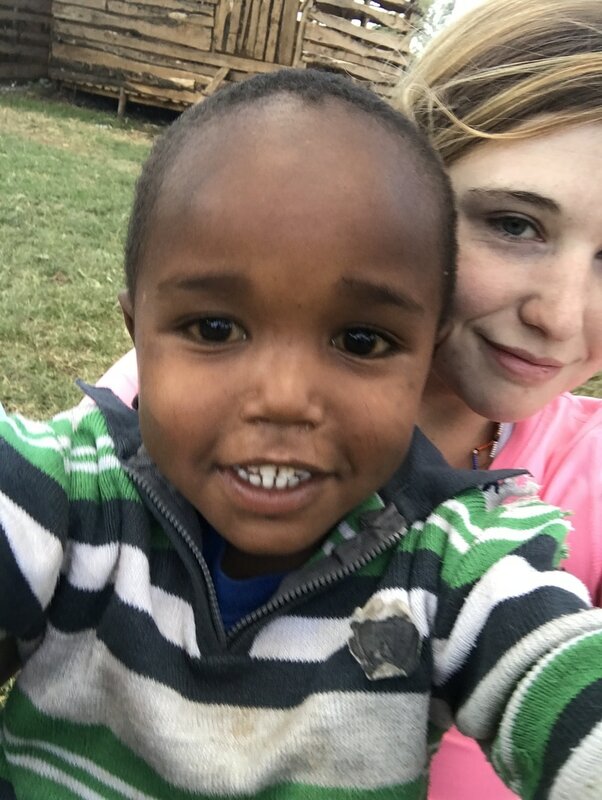 Although he did not understand English, we still found a way to communicate through making funny noises and facial expressions. Saying goodbye to him was difficult, but I am so grateful for the afternoon that I spent with him. Our camera guy, Jeff, noticed that this kid (David) was especially curious about the filming process and video equipment. Jeff made this young man's day when he handed off the job to him and asked him to film the activities. This kid was a natural! He even began interviewing adults like a real documentarian. It was incredible to see such genuine talent from someone who had never held a camera before. At dinner this evening, Jeff shared with us that he made a commitment to David. Jeff promised to send an old camera of his to David once he returned to the U.S. and assist him in learning how to use it via Skype. I have no doubt that one day this kid will have his own production business! Before we left the orphanage, we handed out some soccer balls. 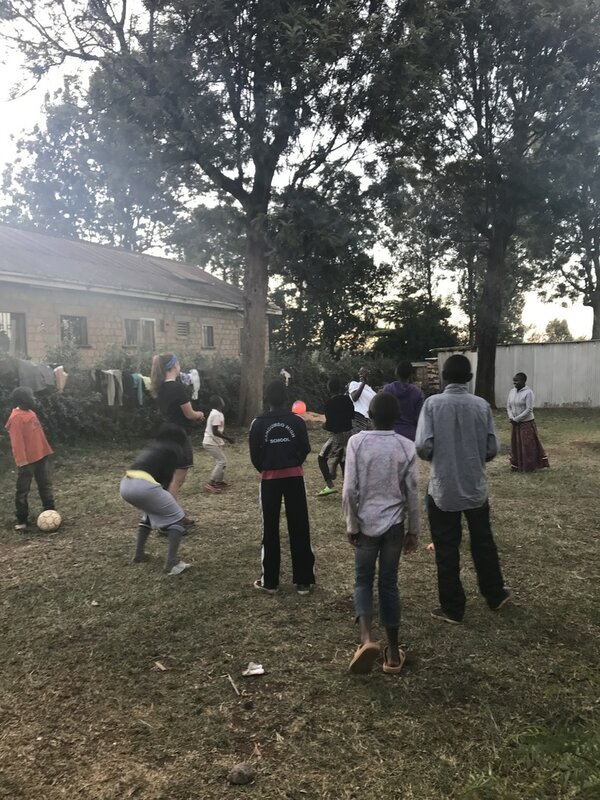 In Kenya, a soccer ball costs about $40 USD...That's about an average month's salary here. The children were incredibly grateful for the gift and began playing right away! These kids really wanted to test out my strength... I'd say I passed the test. Little Martin loving every second of this. And so am I! I have about 45 pictures like this because Martin LOVED to take pictures of himself. But I decided to spare you all and only post one. 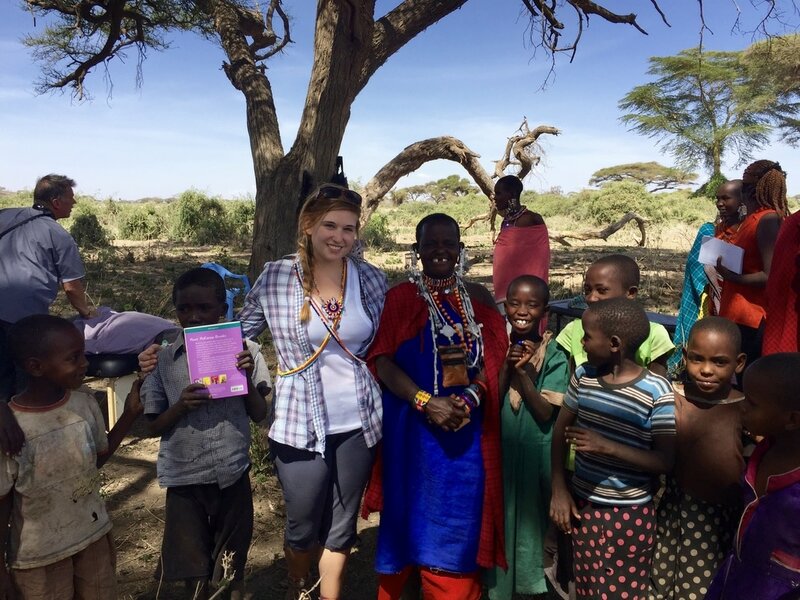 ​This morning we drove to a boma three hours away from campus. 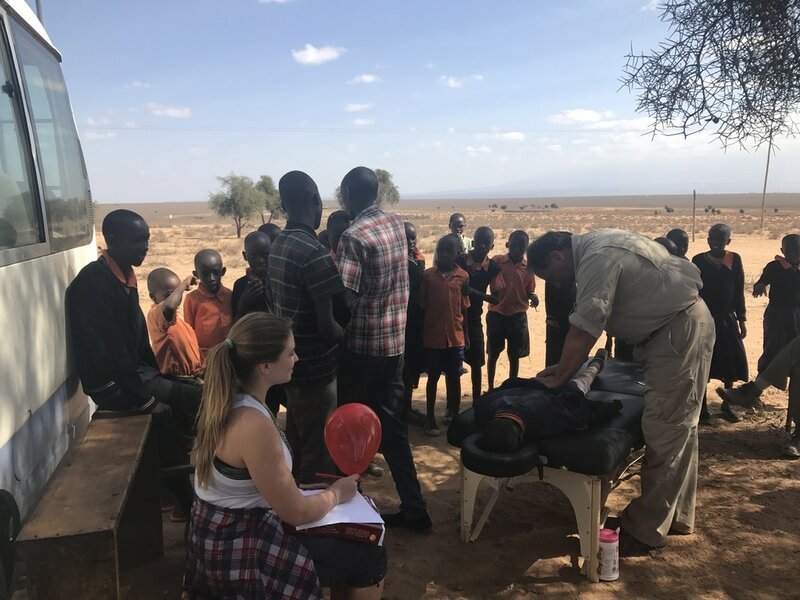 In addition to chiropractic care, student volunteers from Rocky Vista College offered medical assistance. 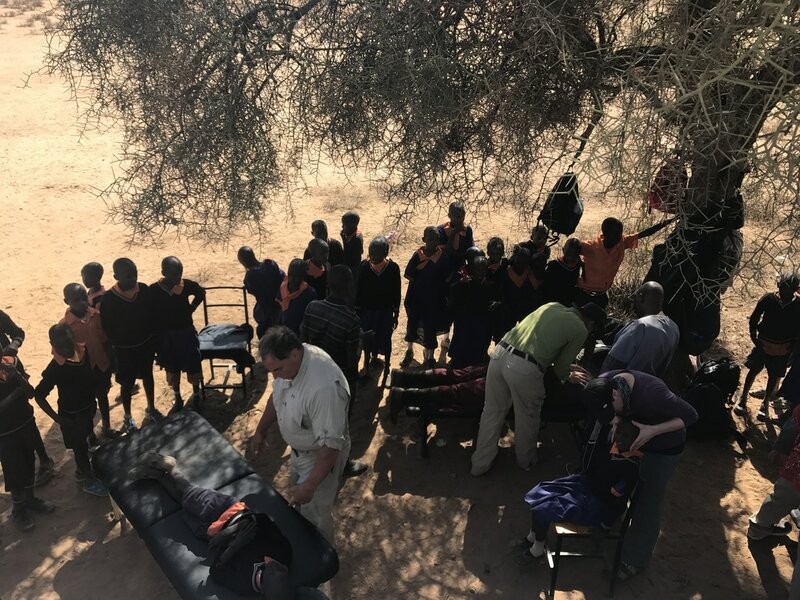 The area we were working in is experiencing severe drought right now so they are especially in need of healthcare, among many other things. 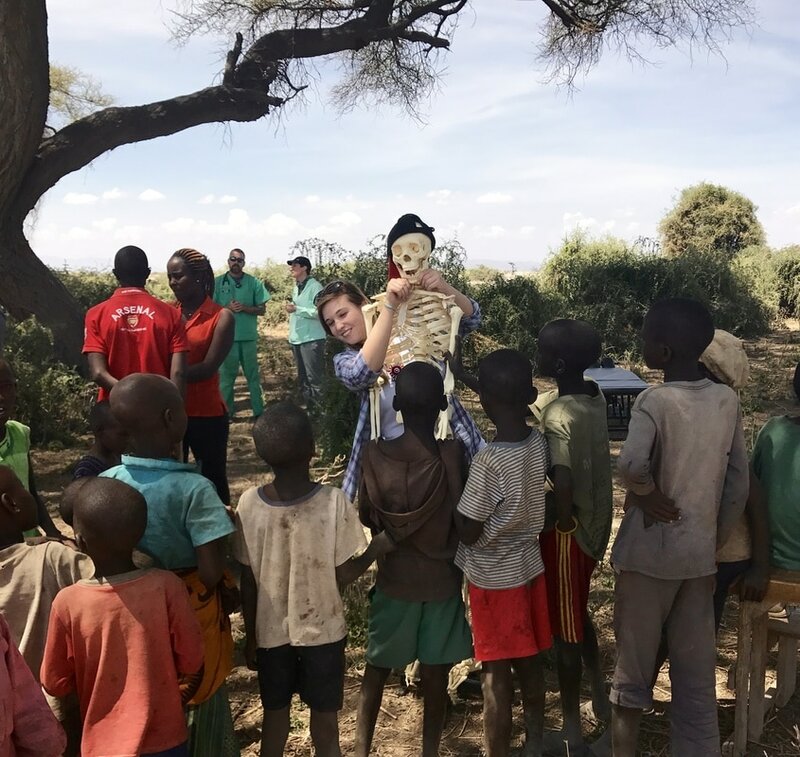 When we took out Timmy the skeleton, the kids were in stitches. My dad uses it to explain the importance of chiropractic care to children and their parents. Many of the observers initially thought it was a real skeleton and were freaked out by it. Once my dad explained that it was only a model, it became more comical. While the medical and chiropractic care was going on, I had the opportunity to read to some books to the children. 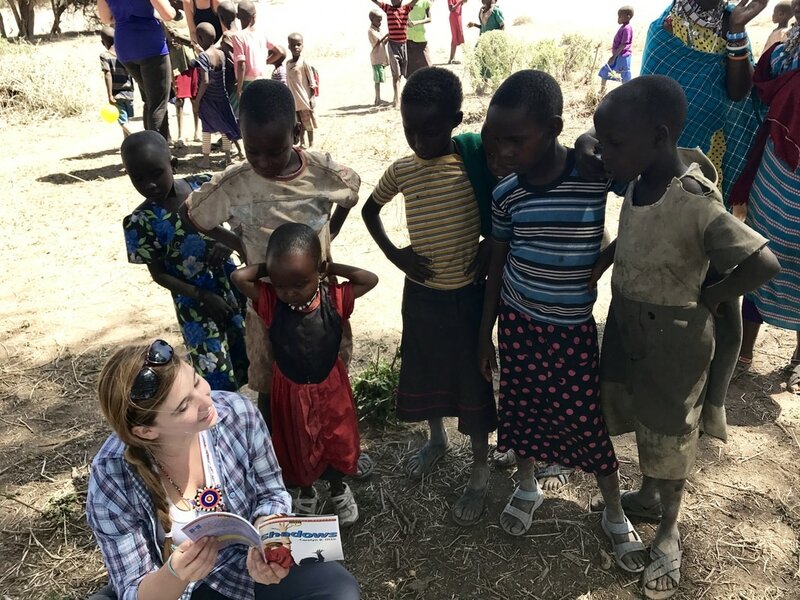 Many of them didn’t understand what I was saying, but they were fascinated by the pictures in the book. Eventually, it turned into a game where I would point to a picture, say the word, and have them repeat it. They seemed to really enjoy that! Notice how in one of the pictures below a girl has her hands weaving through my hair...not at all surprised by that. ​Because the children don’t have any toys, they make a game out of objects they find in nature. 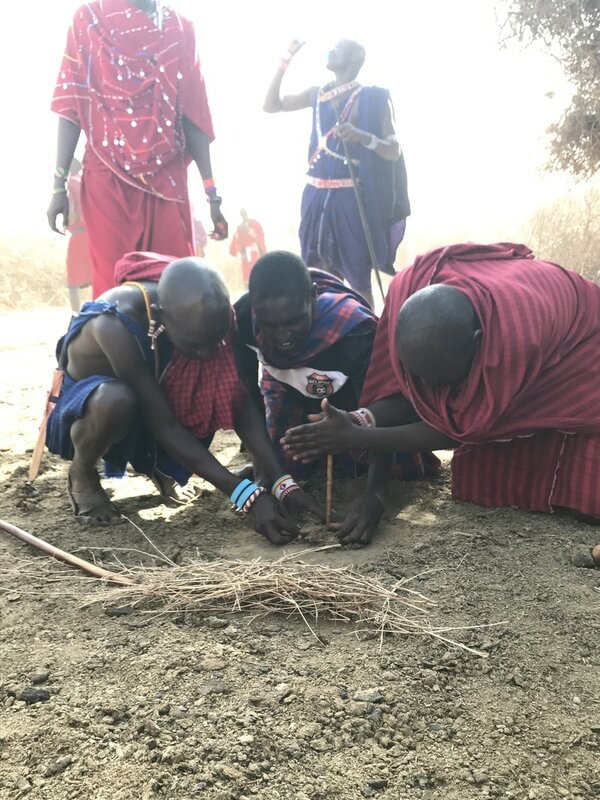 One of their favorite games to play is “boma”, which is the equivalent of playing “house” in the U.S. To build their “bomas” the children gather rocks, sticks, and cow dung. Think of how this compares to the dollhouses we see children playing with in the U.S…. I brought balloons with me to give out to the children. When they spotted the first balloon bring pulled out of my bag, they stampeded towards me. Not even joking. Desperately, tiny little fingers grabbed at the bag and eventually they ripped it from my hands. The pictures above just barely capture the mass chaos that broke out. 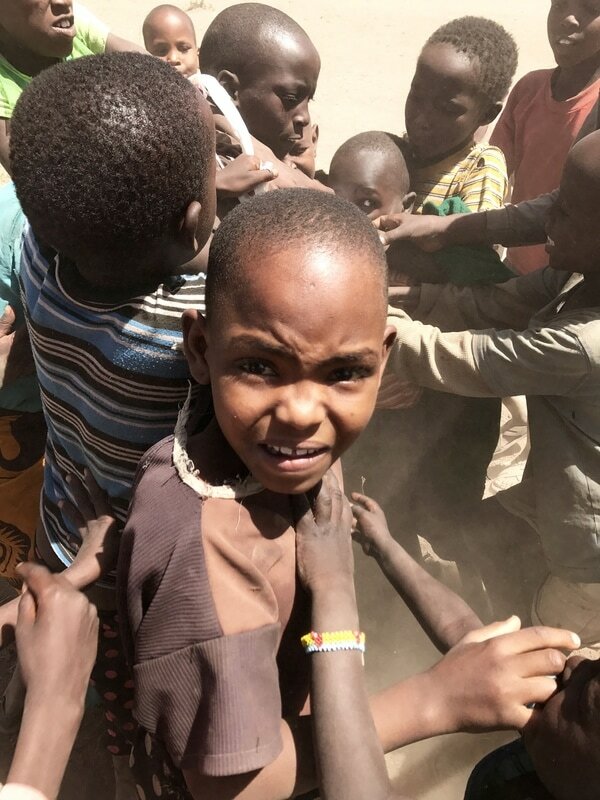 The reason for the grabbing and shoving is due to the extreme scarcity. The kids fear that this might be the last time they will ever see a balloon, so they fiercely compete with one another. Truthfully, it could have been the last time they saw a balloon for years. Small things like this that we take for granted in the U.S. are luxuries out here. I eventually decided that the most fair and least chaotic way to distribute balloons was to leave them behind a bush for the kids to discover at a later point. 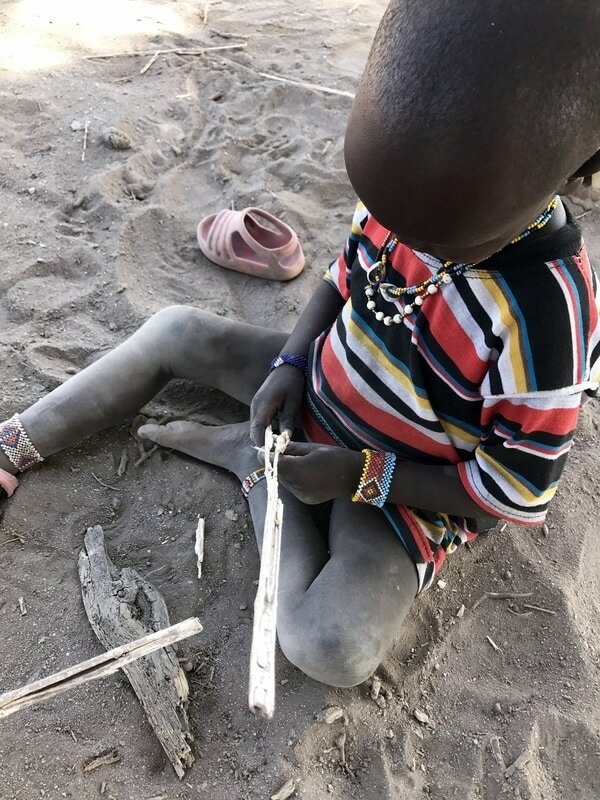 Another example of "toys" for children who live in the bush--Using sticks to play the drums. This little boy was scared when I approached him because he had never seen a white person before. Although I tried to engage him, he sat silently, not moving, until his mama came over and picked him up and told him it was okay. 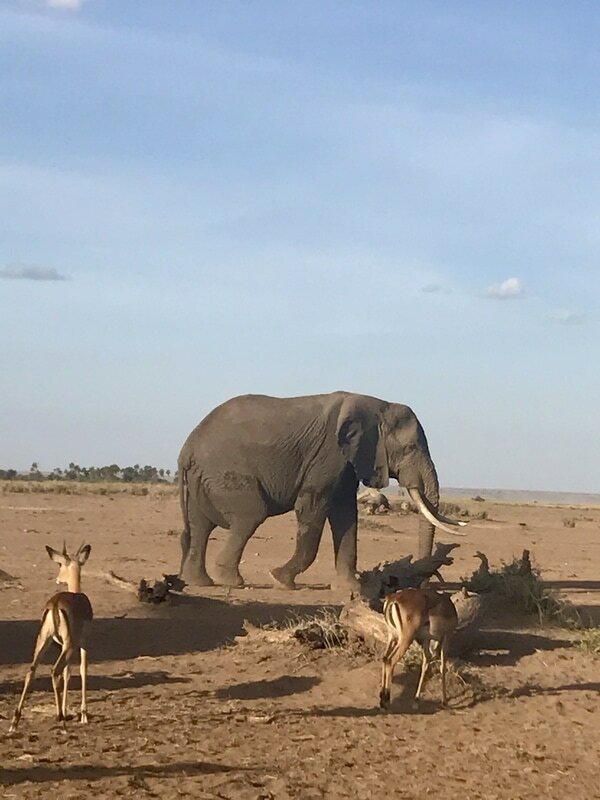 Saw an elephant today on the drive out to the boma! 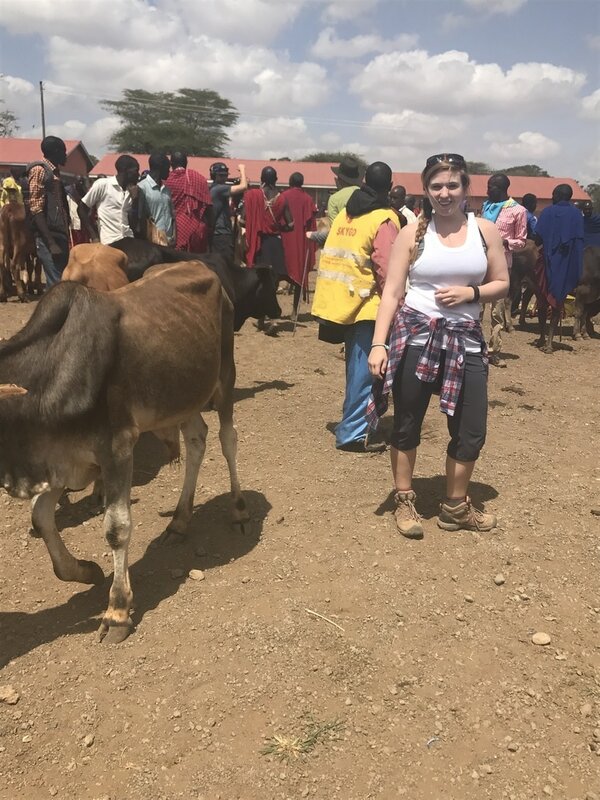 This morning we went to the livestock market in Kimana. My dad wanted to purchase two cows and four goats in an effort to create a sustainable food source for the children on our campus. 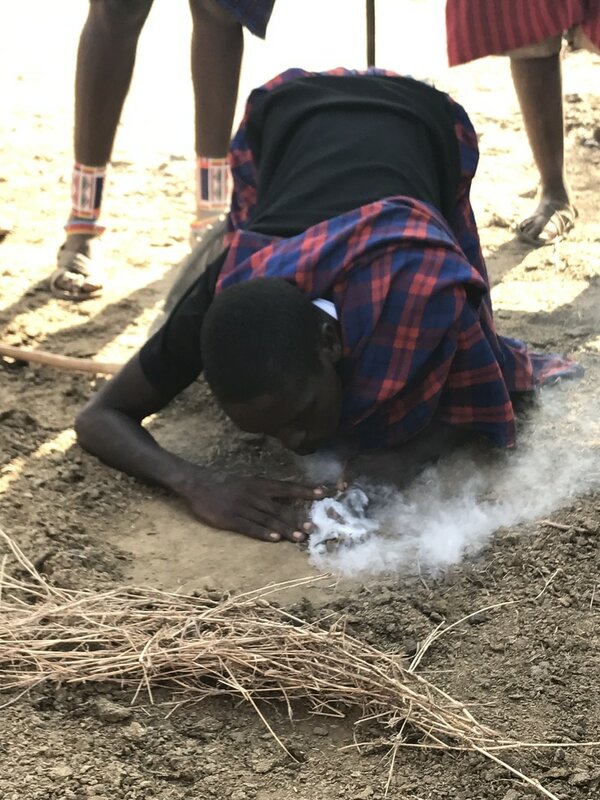 To do this, the livestock will be raised out in the bush by the Masai people and later sold at a higher price than we originally bought it for. The profit from that exchange will go towards feeding the children who attend school at our campus. In addition, the cattle and goats will have offspring so the cycle can continue. Walking into the market was surreal. The smell of cow dung was thick in the air and hundreds of eyes watched our every move. It’s very unusual for a group of mzungos (white people) to enter the livestock market as they often have no purpose for being there. But our group was there to do business. We took Chief Jackson (pictured above) and his buddy, Benson, with us to help negotiate a fair price. Without them, the men selling the livestock would have wanted to charge us significantly more than the cattle were worth because of the fact that we were white. After a good deal of bargaining, we completed our purchase. The goats and cows are going to be kept out in Chief Jackson’s boma and will be raised and cared for out there. After the livestock market, we went to the goods market. I purchased a “chukka” for the wedding ceremony we will be attending on Saturday (more to come about that later!). 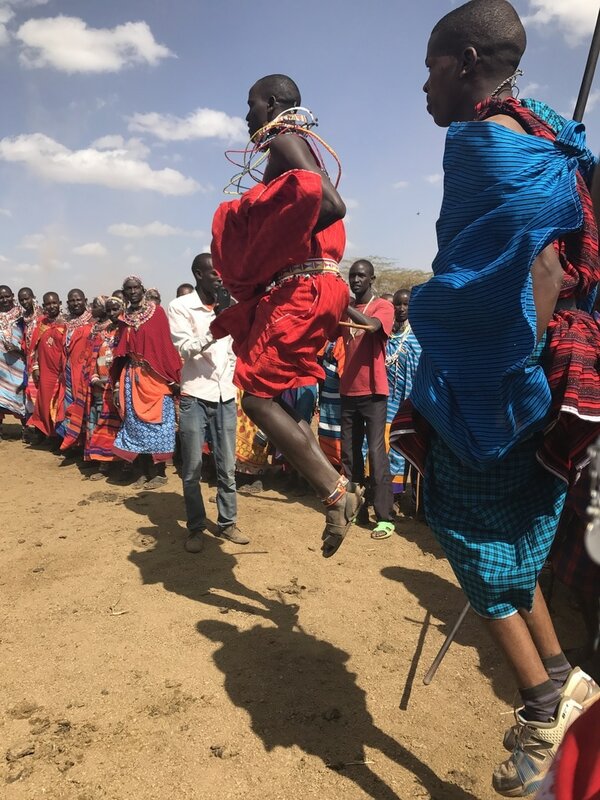 A chukka is a traditional cloth that the Masai men and women wear. I bought one that I thought looked authentic. Turns out I was right about it being a traditional fabric, but what I didn’t know was that it was what the old men wear… oops! 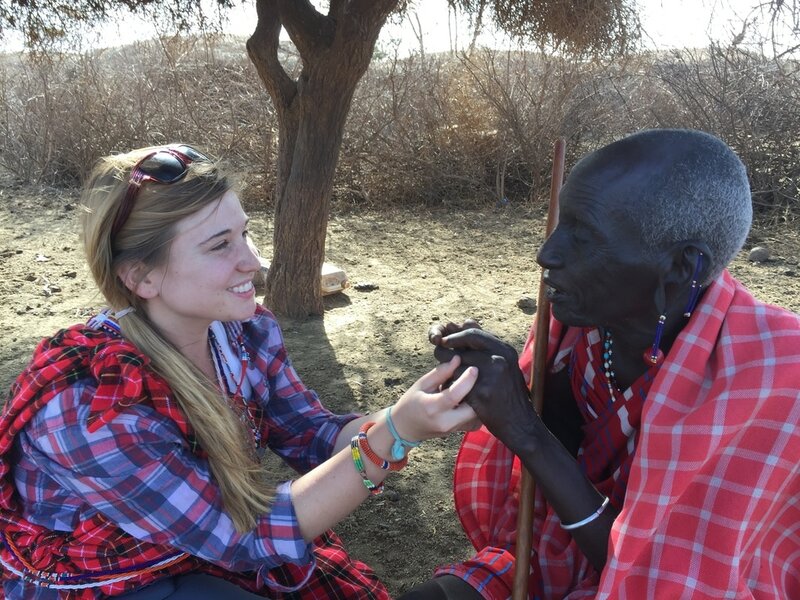 Looks like I’ll be dressing like an old Masai man for the wedding on Saturday. 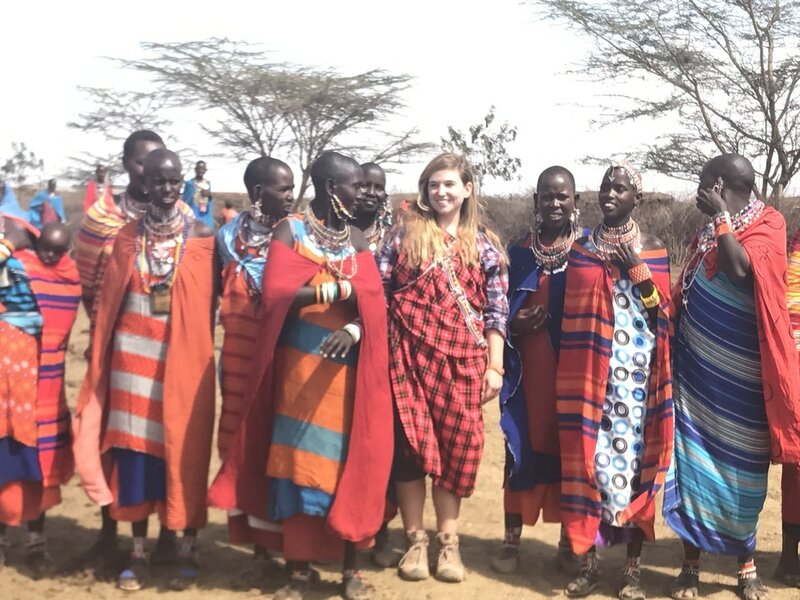 Hopefully that means I won’t have any young Masai men offering my dad cattle in exchange for my hand in marriage like last time I was here! 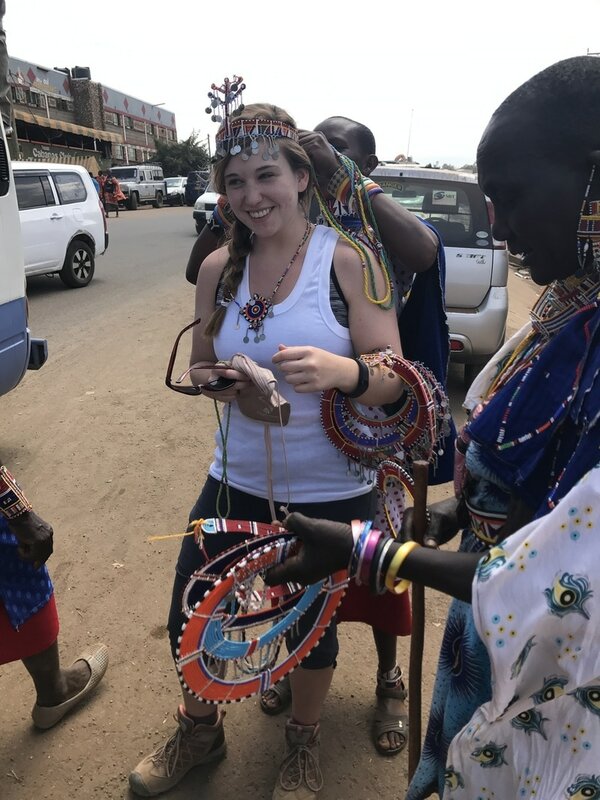 I couldn’t have a complete Masai outfit without traditional jewelry! The women in town began adorning me, hoping I would buy some of their beautiful crafts. And I did, right off their necks. Now THAT is the way to buy a souvenir! ​To get a good shot of the market, Jeff, our camera man, flew his drone over it. The kids in town were fascinated by it. 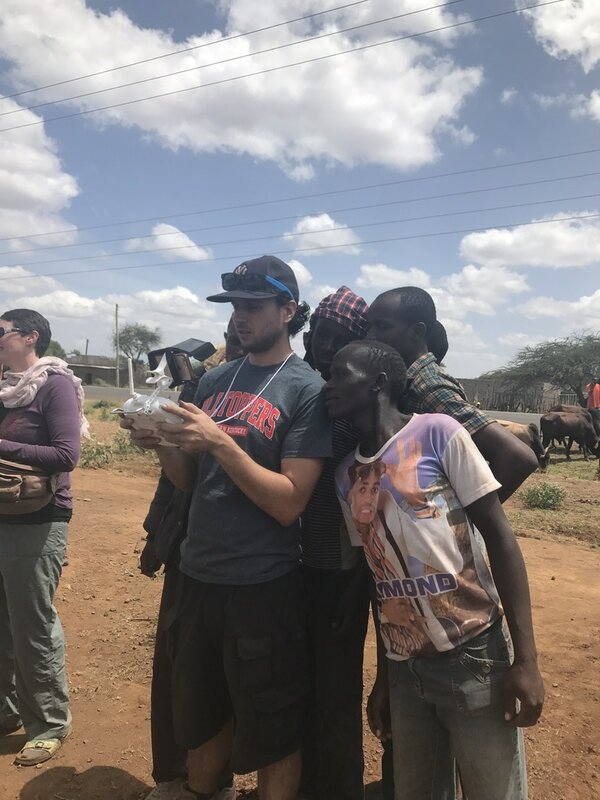 Turns out, drones are illegal in Kenya… oops. In the afternoon, we drove out to a school in Risa (a small town in the bush). My dad and the other chiropractors adjusted the students. At first, the kids were very hesitant to be treated so I turned to bribery as a tactic. I told the kids that whoever was the bravest and wanted to go first would get a balloon as a prize. It worked! After that, the kids were much more relaxed about having their body checked. ​This morning I woke up to the beautiful sight of Mount Kilimanjaro. From my grandparents’ campus we have a clear view of the grand landmark. In a week and a half, my dad will be climbing it alongside some of the other volunteers. After a delicious breakfast with a view, I walked around the campus to see what has changed since I last was here. 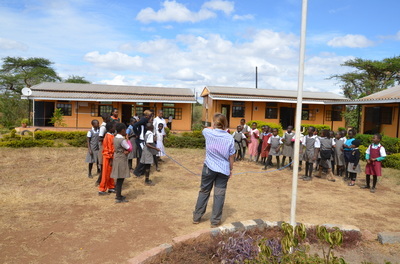 In the past two years, my grandparents and the other sponsors have added a primary school as well as a nursery. There is also a hospital in the process of being constructed. Below I have included some photos of highlights around the campus. The pictures really don’t do it justice. In contrast to the intense poverty that sits outside the gates of The Kimana School of Leadership, our campus is immaculate. 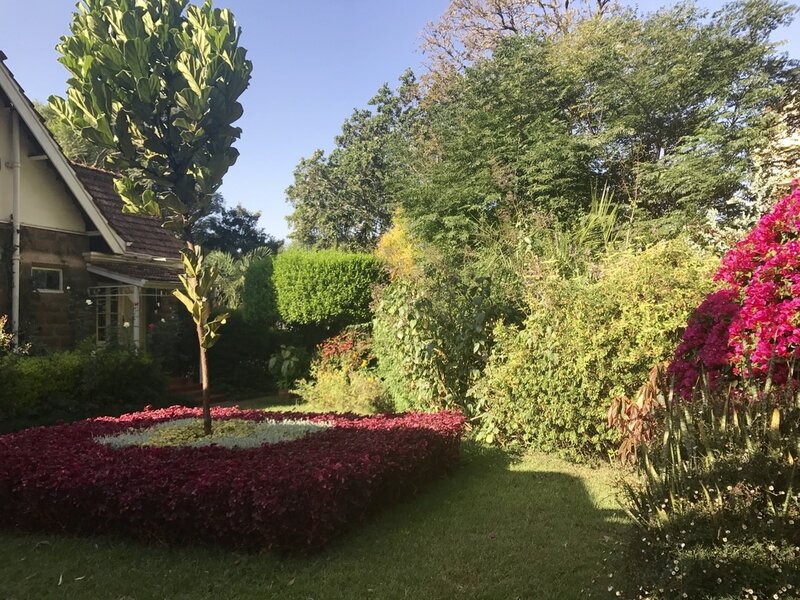 I've included some photos of the campus below, including my grandparents' house, the greenhouse, the main entrance, and the beautiful gardens. 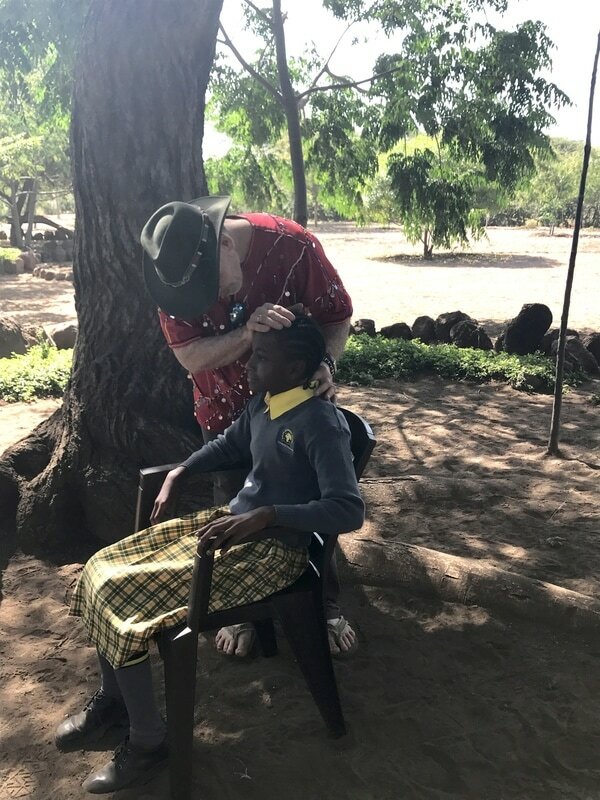 Around 10:00 this morning, my dad, Angela (one of the chiropractors), and I began to pull children from their classroom to adjust them. 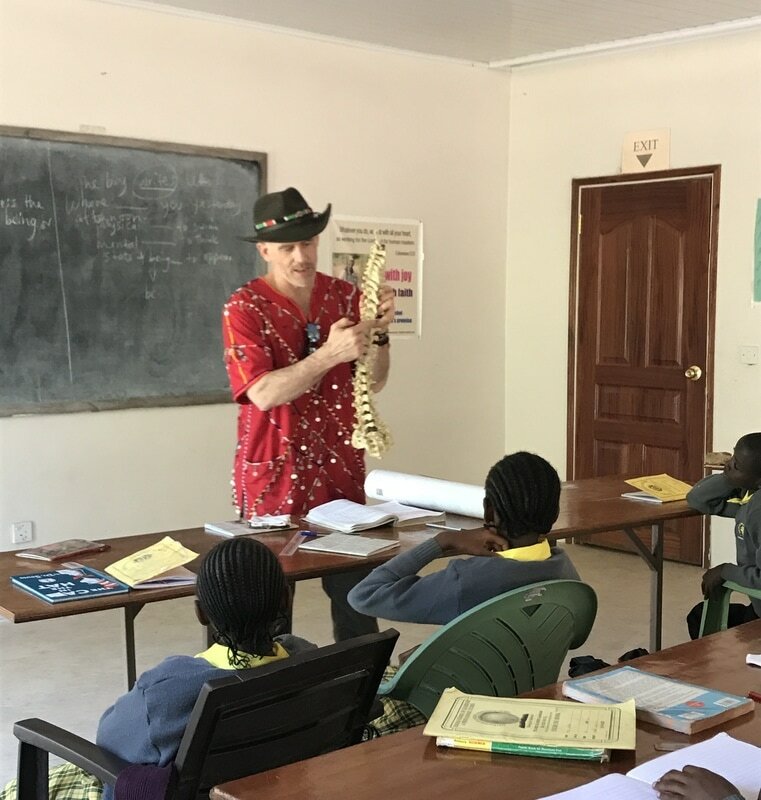 My dad explained to the kids what he would be doing this afternoon and had a conversation with them about the importance of aligning their spine. We led the children out to a shaded area and began our work. 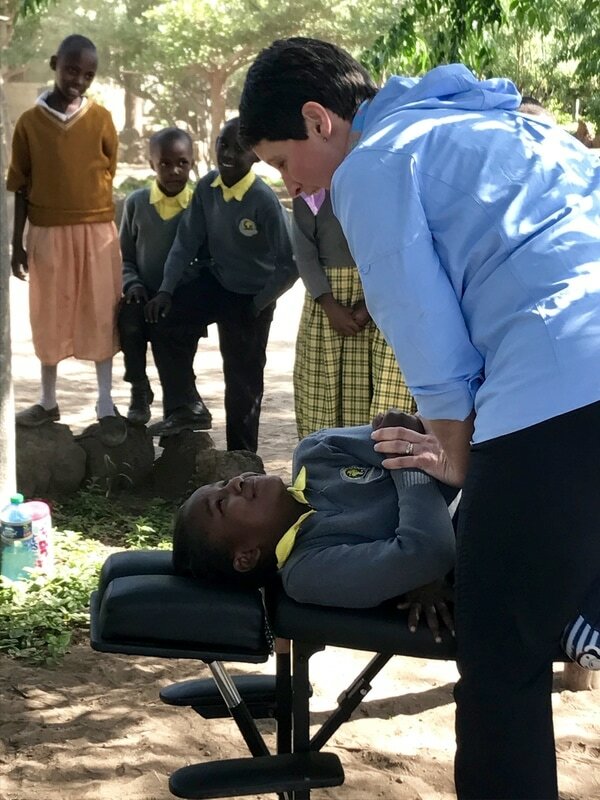 ​The children watched in awe as the brave first classmate laid on the table to have an adjustment. At the sight and sound of the first push, the observing children giggled with amusement. This routine continued all afternoon until every child in the elementary school had been seen. ​Around noon, I walked over to see the children in “baby class”. Baby class students are from ages 3 to 5. Needless to say, they are precious! These kids were even more eager than the elementary students to touch my hair and grab my arms. To try and instill some sense of organization, I taught the kids “Ring Around the Rosie”. After about three or four verses, they got the hang of it. This is my favorite photo from today. 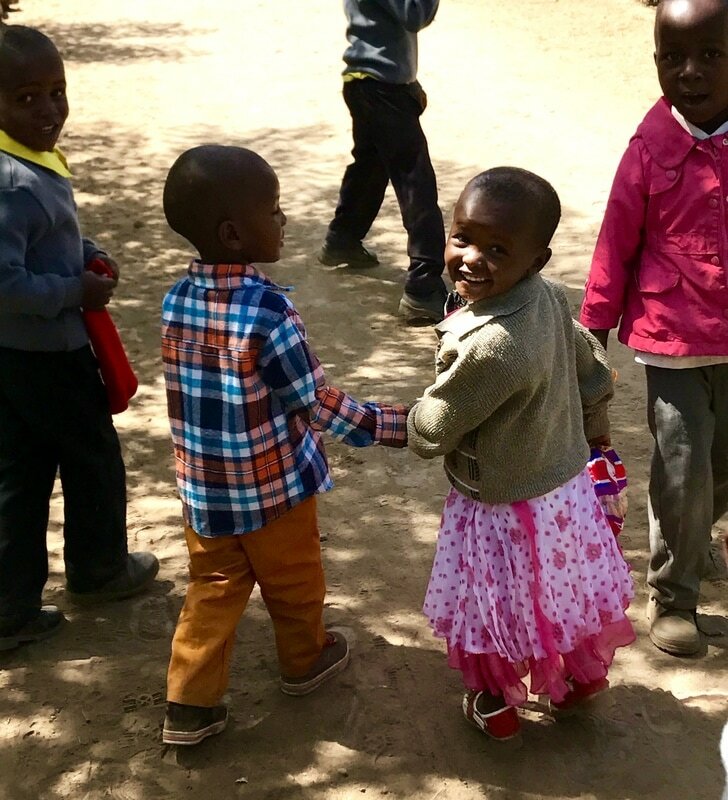 As I was walking to see the baby class, I watched these two children grasp hands and lead one another back to the classroom. I noticed that all around campus, children were arm-in-arm with one another or had their arms around each others' shoulders. There is a profound sense of friendship and bonding among the students here. Towards the end of the school day, my dad spoke with the teachers about leadership and commitment to higher standards of education. To hear him speak so passionately about the mission of Kimana School of Leadership was inspiring. 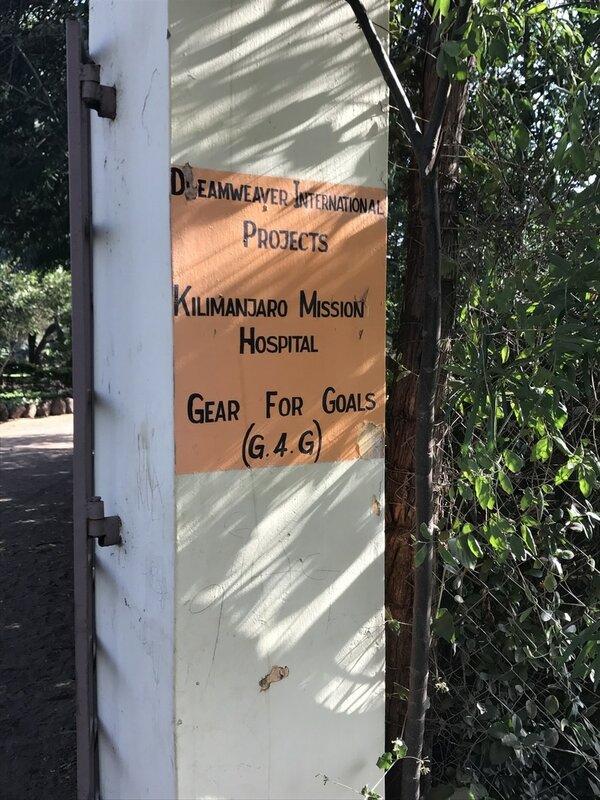 It was an excellent reminder of why I am out here contributing the goals of my father’s non-profit, Dreamweaver International. Discovery of the day: The end of a braid looks like a paint brush, and when it's a white girl's hair it just so happens to be really soft! The kids got a kick out of using my hair to "brush" their face. Partying, fancy cars, and beautiful women--These are the the themes I'm hearing right now as I listen to American music on my iPhone. But what I'm hearing and seeing right now are two completely contrasting concepts. 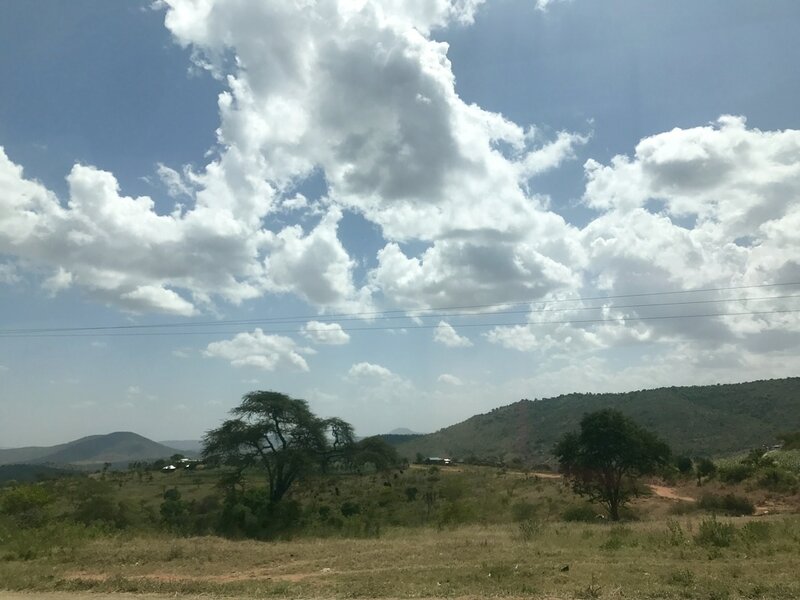 The drive from Nairobi to the Bush entails miles of poverty, struggle, and hardship. Today, we left the city of Nairobi to head to Kimana, a small, rural town 5 hours outside of the metropolitan area. As we left the city limits and entered less civilized territory, I felt the energy shift from struggle to survival mode. The city folk have a tough life, but seem to be able to make do. They have many more resources available to them. The rural residents, however, are faced with scarcity in all aspects-food, clean water, and any convenience or comfort whatsoever. 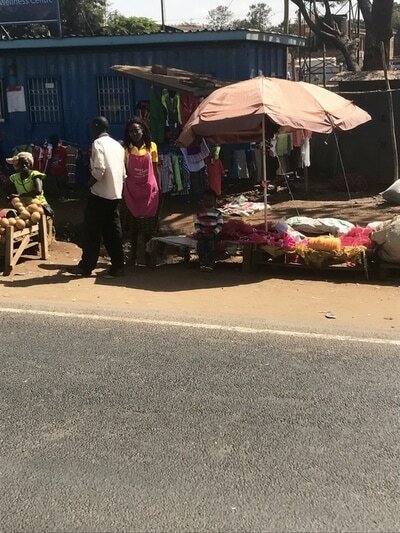 As we passed miles and miles of dilapidated fruit stands and street peddlers, I pondered how these people got by. I mean, there were SO many of the exact same products being sold. If you were lucky, a truck of travelers would stop at your stand and make a purchase. This has to be one of the most competitive markets I've witnessed. Nonetheless, these people pursue their plight to survive and miraculously manage. Lesson learned today-Someone out there is always going to have it more difficult. 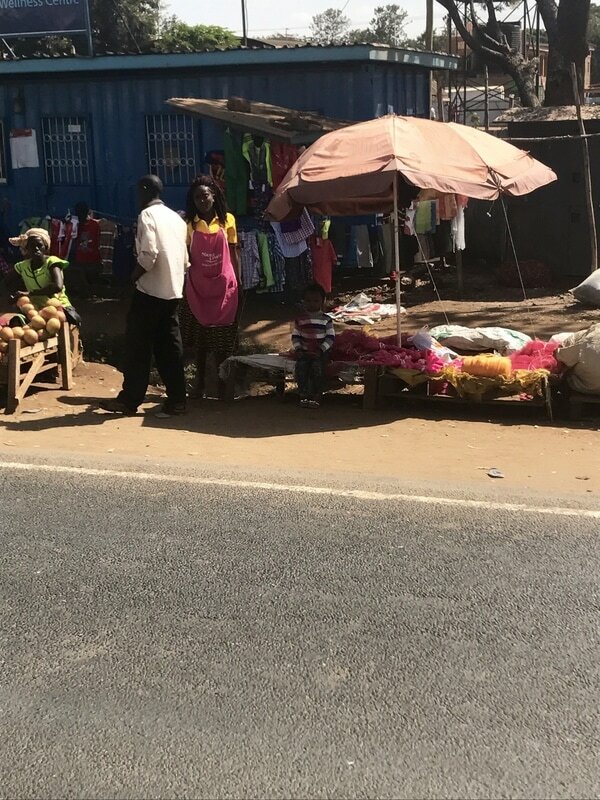 Be grateful for my good fortune, because many do not have the same privileges and comfort I enjoy in the U.S.
​Here are some photos of the markets and peddlers I saw today. If I had to guess, I would say we passed by roughly 300 fruit stands and 200 peddlers. When we arrived at the campus several hours later, we were greeted by eager, smiling faces of students. Instantly, they flocked to our bus and chattered amongst each other about the arrival of the "mzungos" (AKA white people). Not surprisingly, the kids were again fascinated by my hair. I thought the initial curiosity would wear off, but I was mistaken. 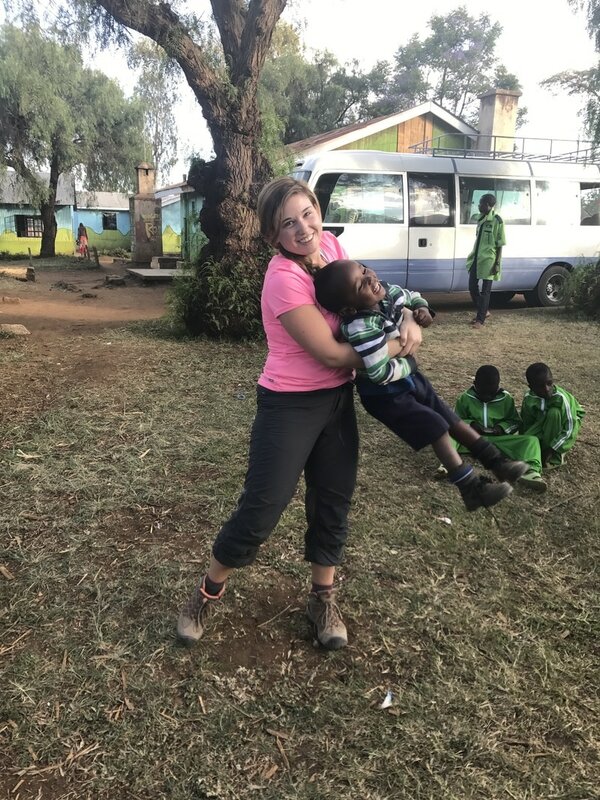 As the kids showed me around their campus and dorms I constantly felt tugging at the back of my head! That's excitement if I've ever seen it! This boy, Richard, was so polite and captured my attention immediately. He was very curious and eager to learn about me. Richard was especially intrigued by my freckles. He pointed to my arms and asked me why I had "dots" on my skin. I chuckled at his description and helped him understand why those "dots" were on my arms. The kids taught me how to play one of their favorite games this evening, "hoop and stick". Turns out, it's harder than it looks... Maybe I'll get better if I keep practicing with them! ​breakfast that specially serves missionaries. ​After breakfast, we drove to the Mathare slum to serve in a local church. We were greeted by Pastor John and taken to our workspace for the afternoon. 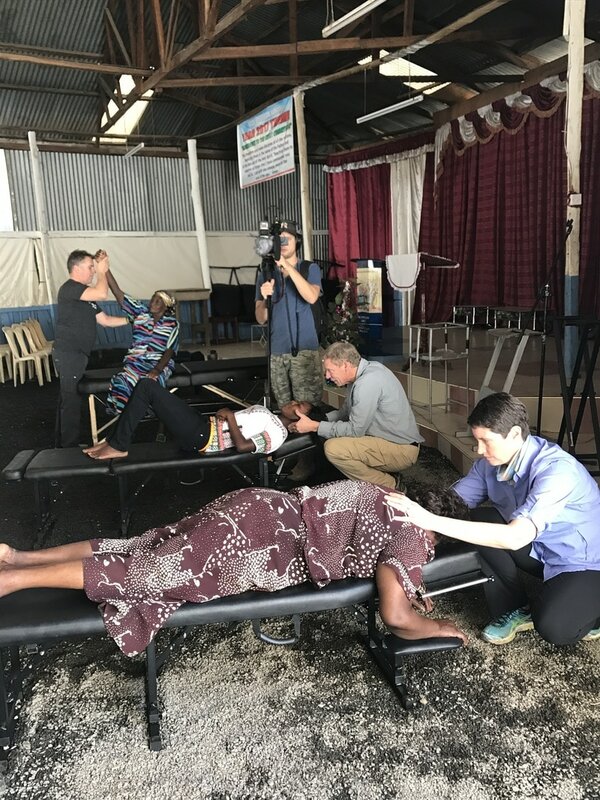 The chiropractors set up in the main space of the church and welcomed locals to come in for free adjustments. 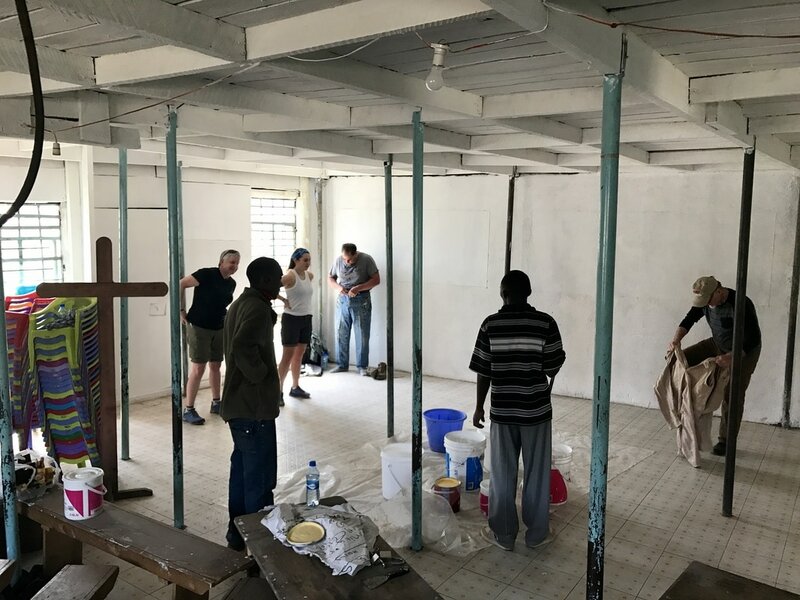 In total, the doctors saw over 100 people and worked for over 5 hours. Lots of straight spines were created today! Angela, pictured on the right, specializes in pediatrics. 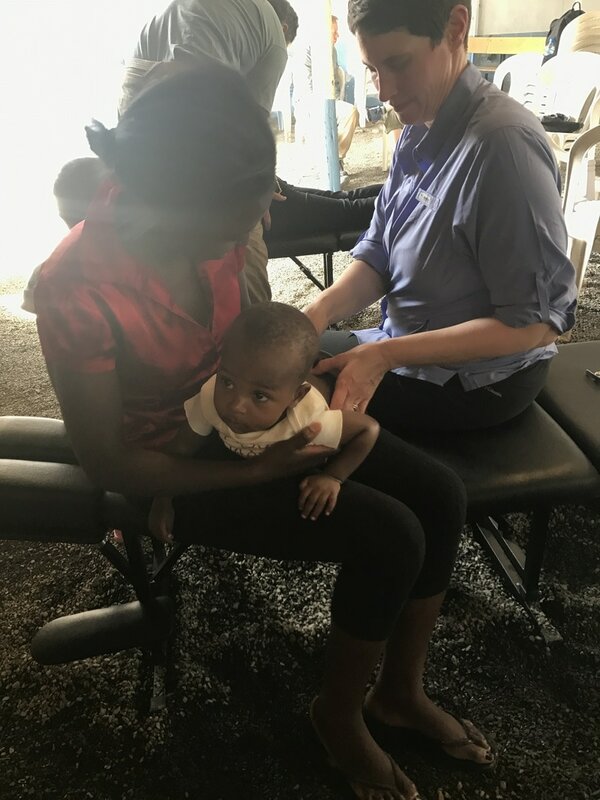 It was adorable to watch these itty bitty children get adjusted. They had no idea what was happening to them! 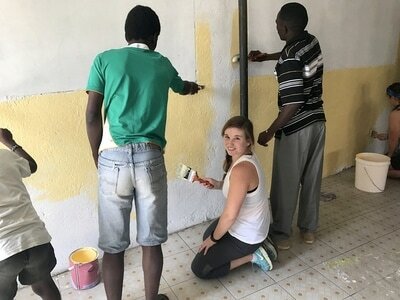 ​While the doctors went at their work, some volunteers and I assisted community members in painting their local church. To many Kenyans, worship is a critical aspect of life, so having a peaceful space to honor the Lord is greatly appreciated. 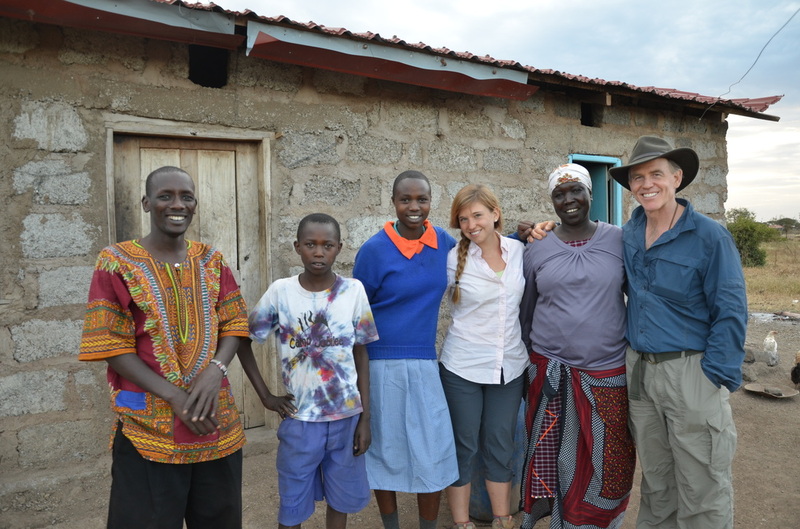 It was fantastic to work alongside the locals and hear about their experience as a Kenyan. The boys were also very curious about American culture. Most of our conversation revolved around food, but who doesn't love to talk about food!? 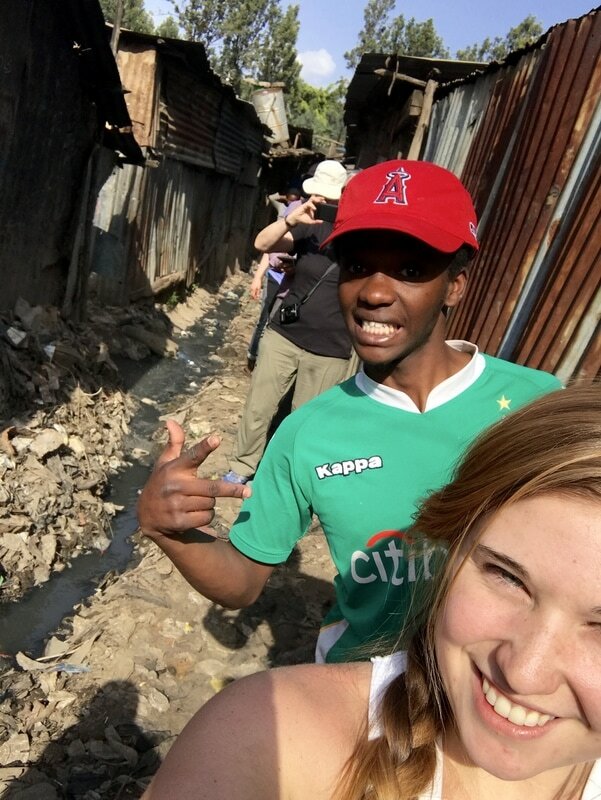 ​After completing our work at the church, our group took a walk through the Methare slum. 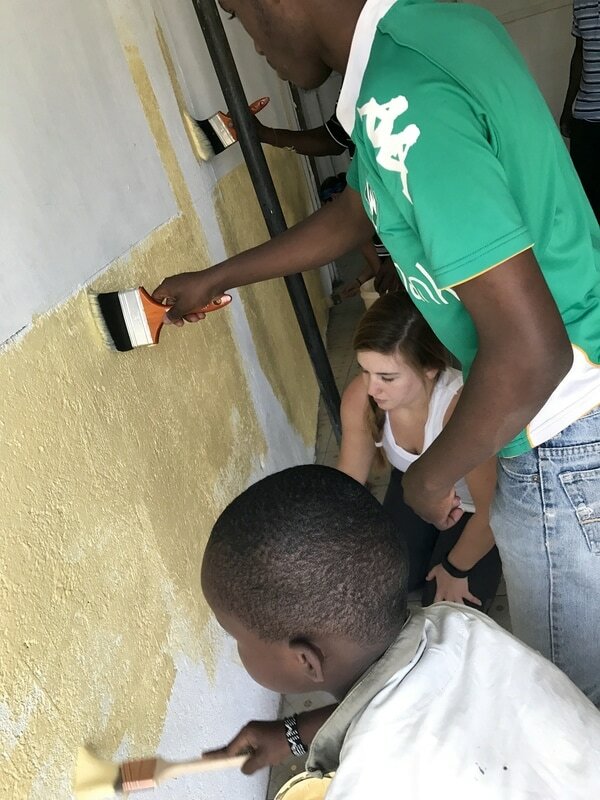 A kind young man named Dennis (pictured in the green shirt) guided us through. Below are some photos of the shocking conditions. Trash is pervasive throughout the slum. The amount of trash in the slum is terrifying. 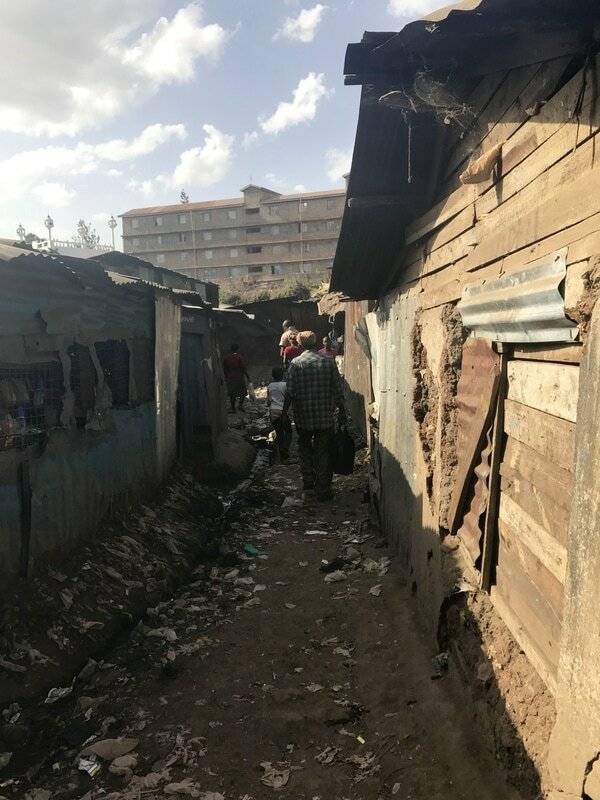 It's heartbreaking to see people living in these conditions. As we walked through the living quarters, I could feel my feet sinking into the squishy ground, most of which was garbage. 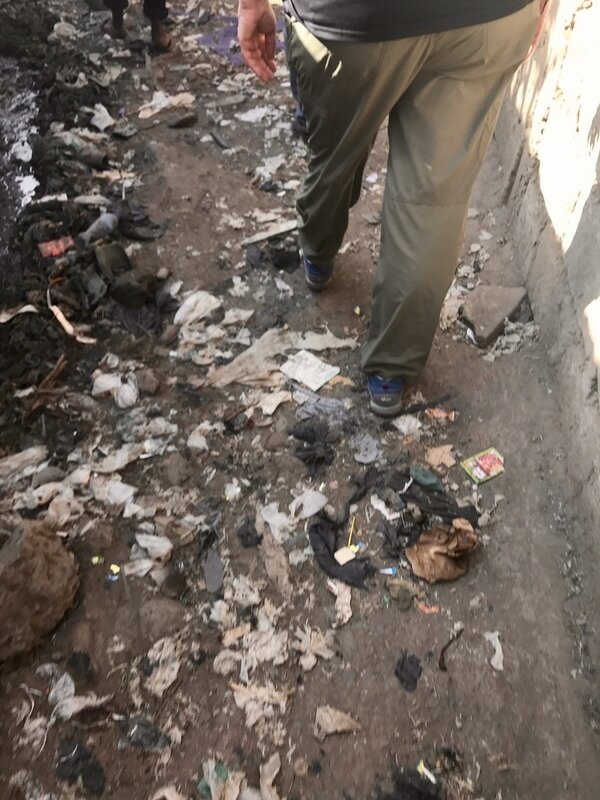 We had to be especially careful where we stepped because there were rivers of sewage running through the slum. The smell was indescribable... And not in a good way. Picture a bathroom that has not been cleaned for a year. This kind of living is unacceptable--no one should have to be subject to this kind of poverty. I don't intend to sound negative in my description, there just simply is no way to describe how depressing these conditions are. However, despite the rough lifestyle, the kids in the slum were as happy as clams. When we entered they flocked to our group and immediately started pulling at my arms and touching my hair. They are fascinated by long blonde hair! This is a trend I noticed last time I was here as well. My grandmother, who lives out in Kenya, once explained to me that to the children it's as though they're seeing a Barbie doll in real life. I'm definitely no Barbie doll, but I am amused by their fascination! The kids LOVE to have their picture taken. They are fascinated by any technology, really. They were also very intrigued by my Fitbit. Discovering snapchat for the first time was a blast for them! This little girl kept looking at me after the sunglasses and headband filter would pop up on the screen to make sure that we had not, in fact, changed outfits all of a sudden. This is what a "playground" looks like in the slums. 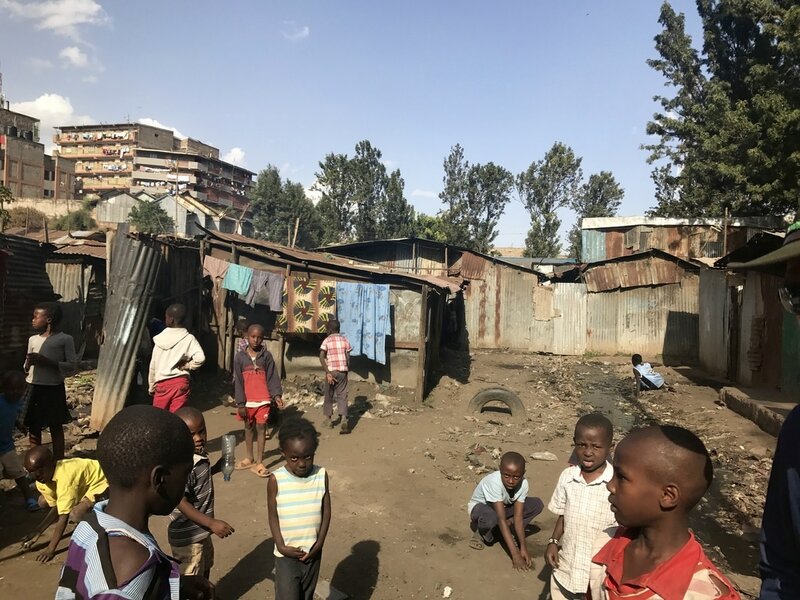 The kids run around piles of trash and sewage, with no toys or equipment to play on. 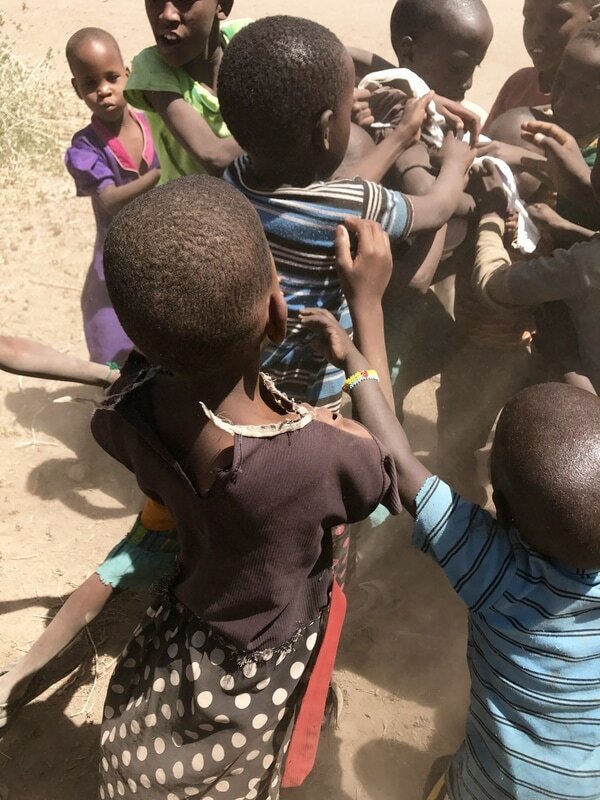 Despite the situation, they were incredibly joyful and energetic! Imagine, though, to have this be your childhood "playground"...How would you feel? This young boy caught my attention on the "playground". At only 7 years old, he was carrying around his baby brother everywhere. It was so endearing to see a big brother care for his little brother like that! I had the chance to sit down and talk with the older brother, George, about what it was like to be a big brother. He was very proud! To the left, I present to you, the toilet we used today! Or rather, the hole. This is very common, so I was not at all shocked. 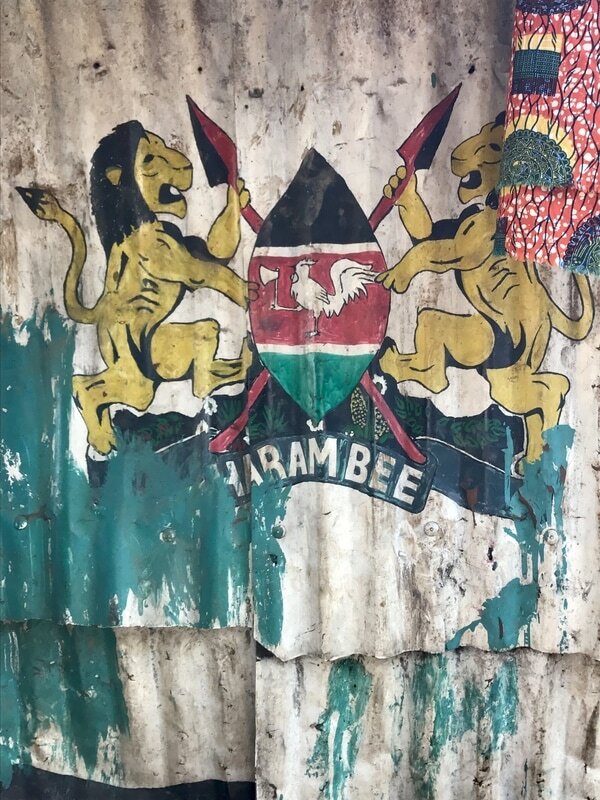 And to the right…I found Harambe in Africa! Well, almost... Harambe plus an extra "e". Good enough for me! What better way to end the day than with an authentic African beer and pizza? 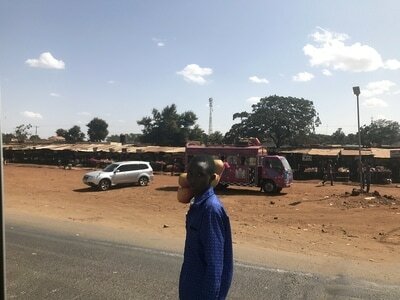 That's right, pizza in Africa! I mean, cmon', what did you expect of me? If there is pizza somewhere, I am going to find it...Overall, outstanding first day! So grateful to be on this meaningful trip with wonderful people. 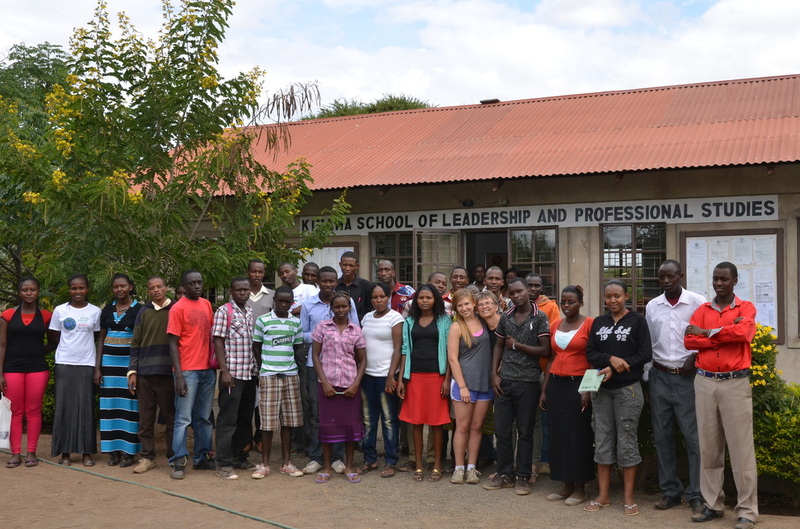 This morning we said goodbye to many of the college students because they have finished their semester. On the right is a photo of Lucy and me. She and I quickly became friends and have taught each other many things about our cultures. I am so grateful that I was able to get to know Lucy and look forward to staying in touch with her! This afternoon we went to a soccer field near the District Hospital in Loitokitok to bring sports equipment to one of the local teams. It was awesome to see the boys receive new equipment and to watch them begin to learn the game of baseball. Some of them were pretty good actually for their first time! As we were leaving the field, we stopped the truck for a moment to get directions. Upon stopping, we observed that there was a man lifelessly sprawled out, face-first, on the front steps of the hospital. Around him, people chatted casually and walked by. No one acknowledged his presence or urgent need for medical attention. This was shocking. My grandma sprang out of the car and ran to the steps yelling “Someone get this guy some help!” I mean seriously, what kind of hospital was this that no one gave the poor man any medical attention even as he lay helplessly on the ground, spitting up blood and fluids? As soon as my grandma started calling attention to the scene, a stretcher was brought out and the man was taken to an exam room for X-Rays. He was barely able to speak but informed the nurse that he had been hit by a taxi and dropped off (more like abandoned) on the steps. At this point, I left the room to give the doctors some space to work on reviving him. I found out 20 minutes later that he passed away just minutes after I had left the room. It was difficult to wrap my mind around the fact that someone who I had been with moments ago had just died. I sat there contemplating if there was more that could have been done to save his life, wishing that I had a solution or a means to help. In the evening, we were faced with another troubling situation. We went to the hospital to visit three children who had been diagnosed with aflatoxin ingestion after eating maize that had bacteria growing on it. 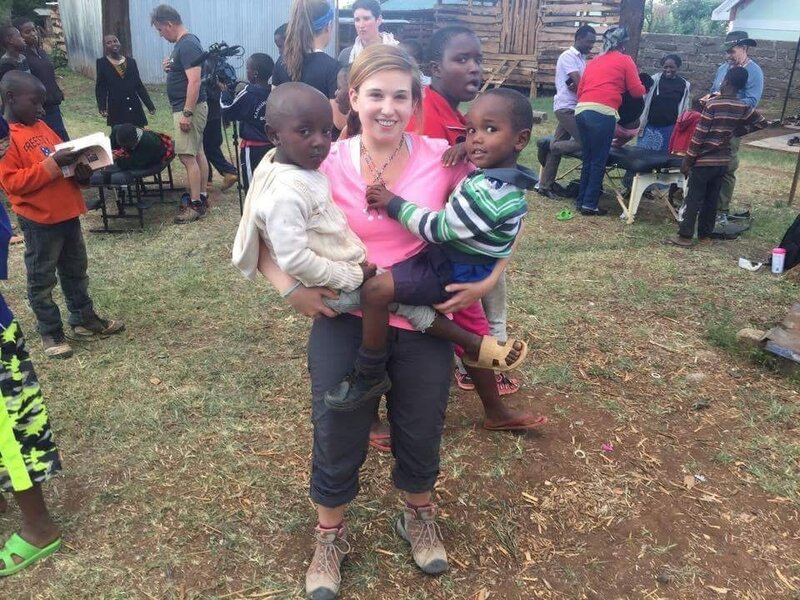 Two of the kids’ health was improving, but one boy was in critical condition when we arrived. He was wheezing with every shallow breath he took, clearly struggling to breathe. As he gasped for air, he gurgled up fluids. His stomach was inflamed three times its normal size. I wished there was something—anything—that I could do to help him. Looking at his helpless body, I realized no amount of money in the world could help the boy now. Often, we measure the value of many things in dollars, but you really can’t put a price on life. We left the hospital to pick up some vital medicine for the boy, hoping that this would improve his condition. As my dad was searching through the pharmacy, he received a call from one of the doctors at the hospital…The boy had passed away. I’m still processing the things I saw today. It's evident to me that the people out in "the bush" don't have the resources or means to receive good health care. Because of this, two people (and probably many more) lost their lives to illness today. What I find most troubling is that what I saw happen today occurs multiple times a day, all over the world. 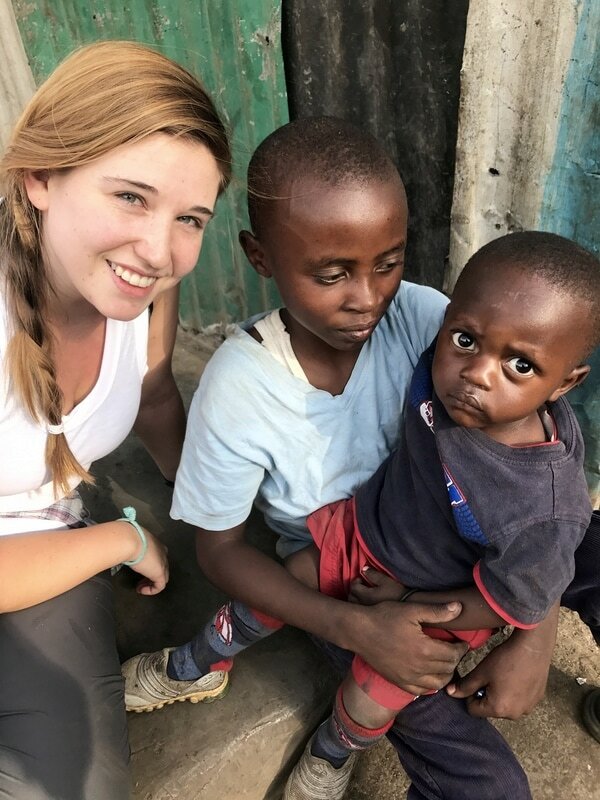 There is certainly a lot that needs to be done to improve healthcare in third world countries but I am grateful that there is actively something in the works in Kenya. Right next to KSLPS college, my grandparents and others are in the process of building a hospital. I am certain that this hospital will bring better health to the people of Kenya and restore a sense of hope in the people. 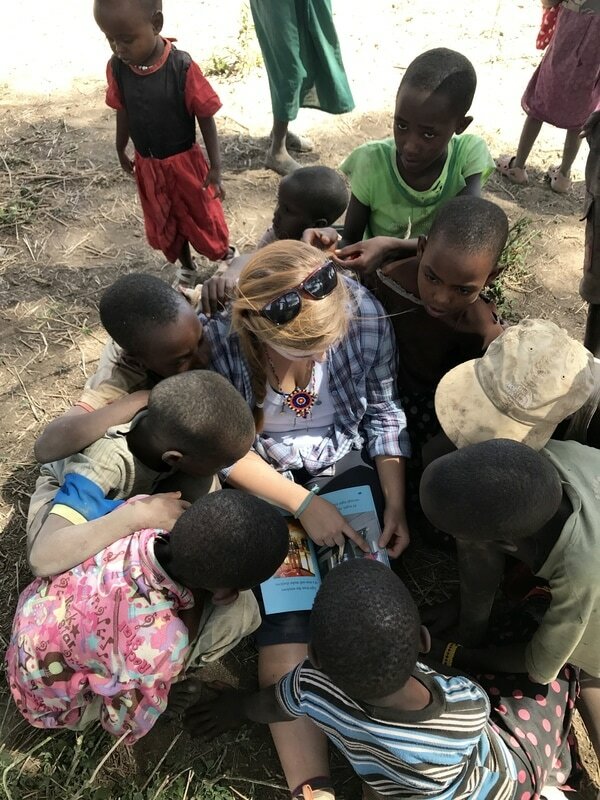 Today was by far the most rewarding day of my experience here in Africa. 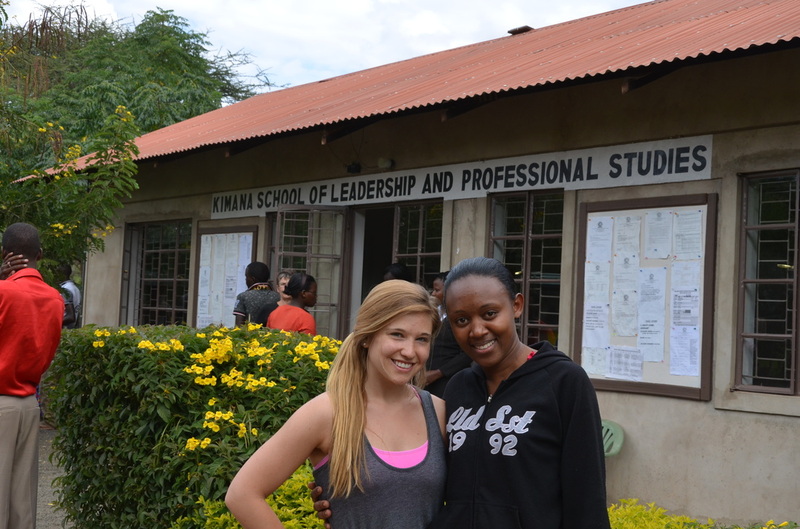 We arranged to pick up Lilian from her school to spend the day getting to know her and showing her around the Kimana School of Leadership and Professional Studies. When we greeted her, she was all-smiles as usual and radiated with joy, knowing she was about to have a very special opportunity. As we were leaving, her classmates wanted to make sure she would be safe and that she would return. Her peers really look up to her and admire her many accomplishments. She is number one in her class and a star track athlete, amongst many other things. 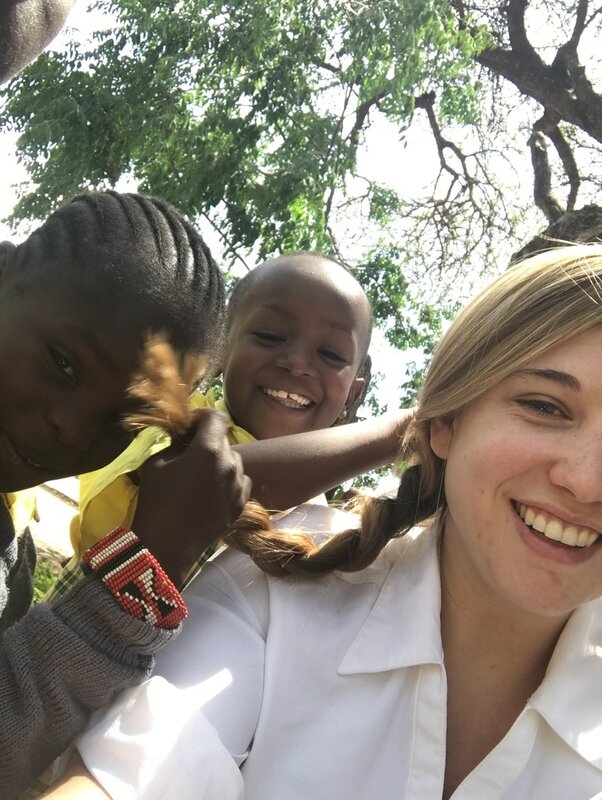 Before we left, I recorded an interview with Lilian, asking her to talk about her circumstances and what it would mean to her to receive financial support to get a high school and college education. I will post a video of the interview on Facebook, but I can re-cap what she said for the most part: Lilian is 14 years old and has 5 brothers. Her father is 85 years old and her mother is 60, but her father left them years ago. Now, she lives with her mother and two brothers in a two-room shack. Soon she will have to leave her home because her family no longer owns the land plot. 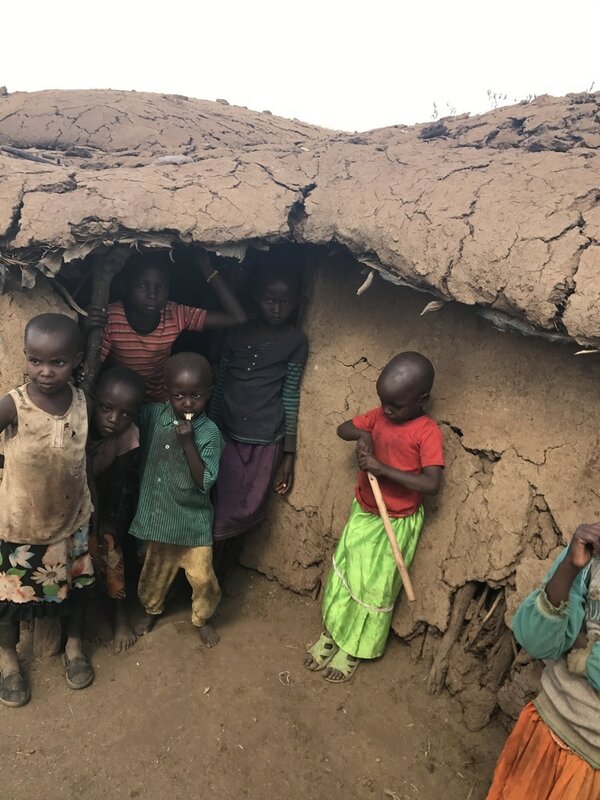 They will move in to an unfinished two-room hut, with no roof over their heads. Aside from her oldest brother, Paul, none of her other brothers have been able to continue their education past grade 8. 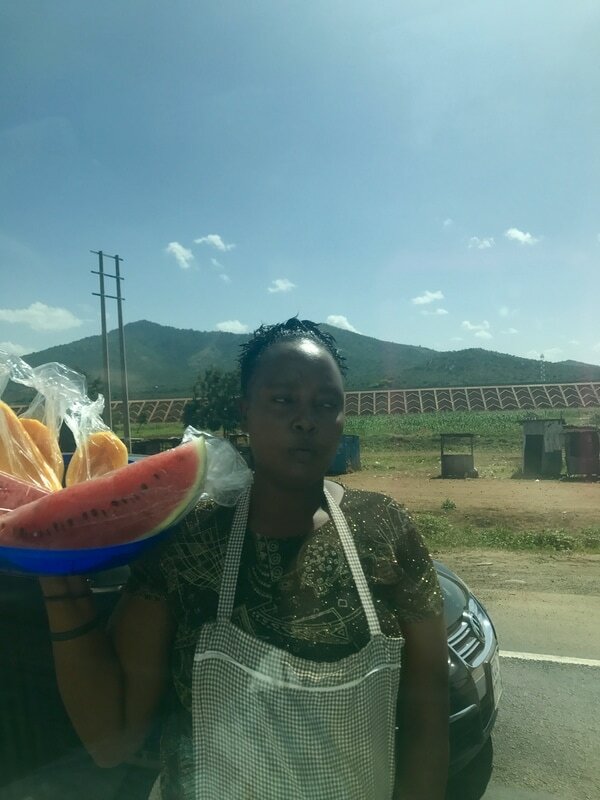 Due to their financial status, the same circumstances apply for Lilian. I asked Lilian what it would mean to her to have the opportunity to continue her education beyond grade 8. At the thought of this, she began to cry tears of joy and was at a loss for words. This moment was the pinnacle of my trip. 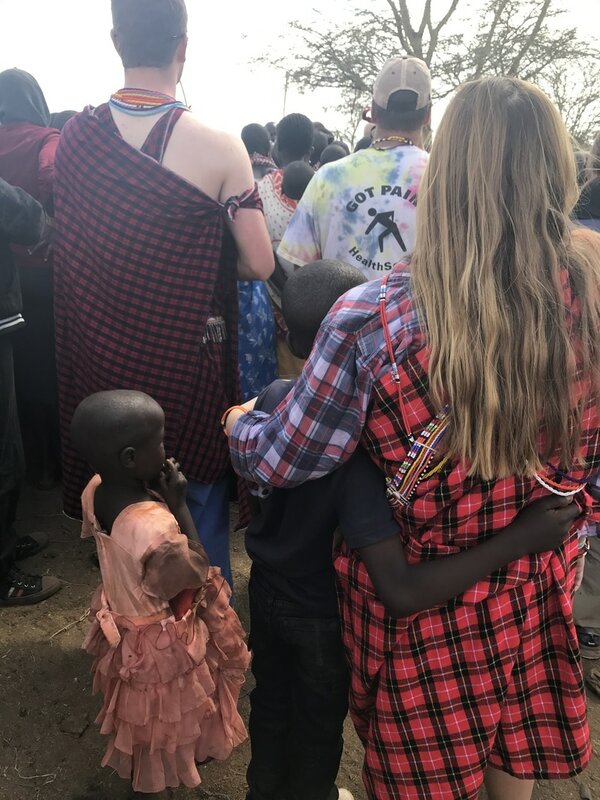 To see a young woman gain a new hope for her future and receive the blessing of education reminded me why I had come to Africa—to bring hope and opportunity to the children here. 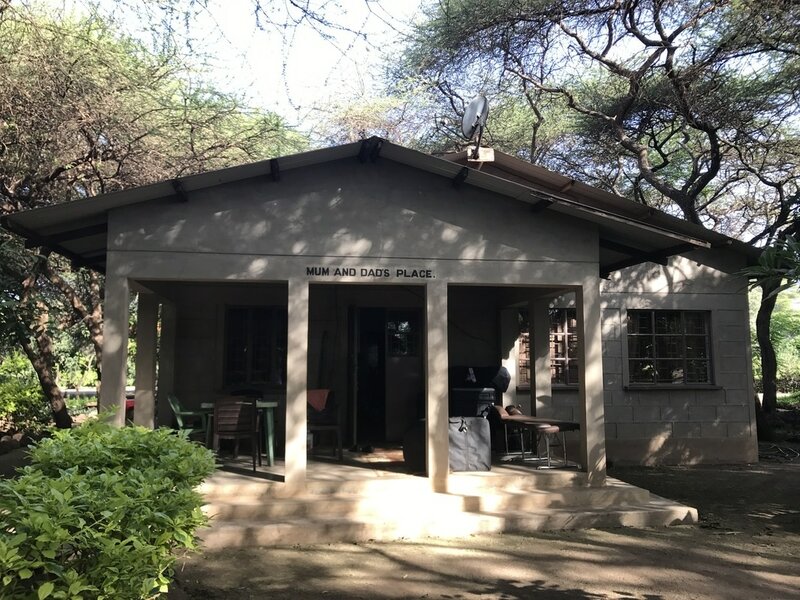 When we arrived at the Kimana School of Leadership and Professional Studies, I showed Lilian around the college campus and told her about the different courses available here. 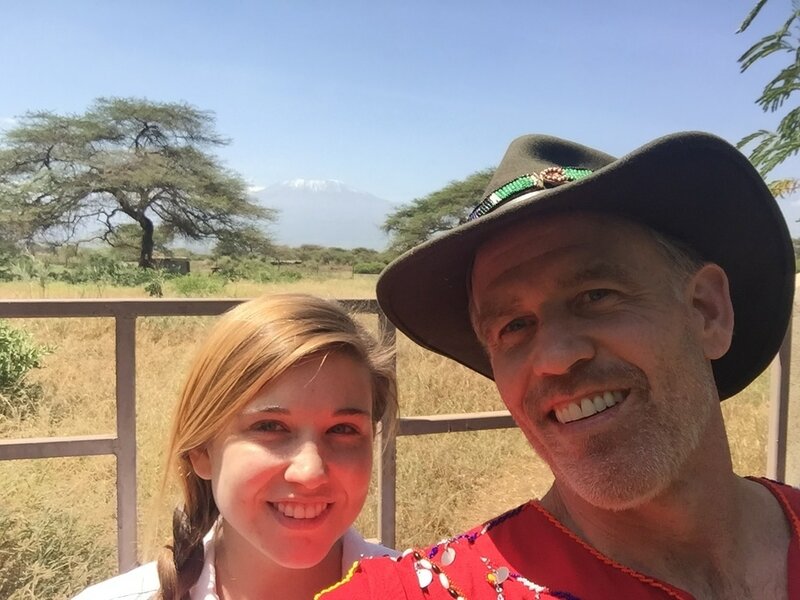 By bringing her to the college campus I hoped to provide her with a vision of what exists in her future if she continues to work hard in school and stay out of trouble. As a part of financially supporting her, I explained that she would need to update my grandmother on her report cards and do some yard work around the college compound. 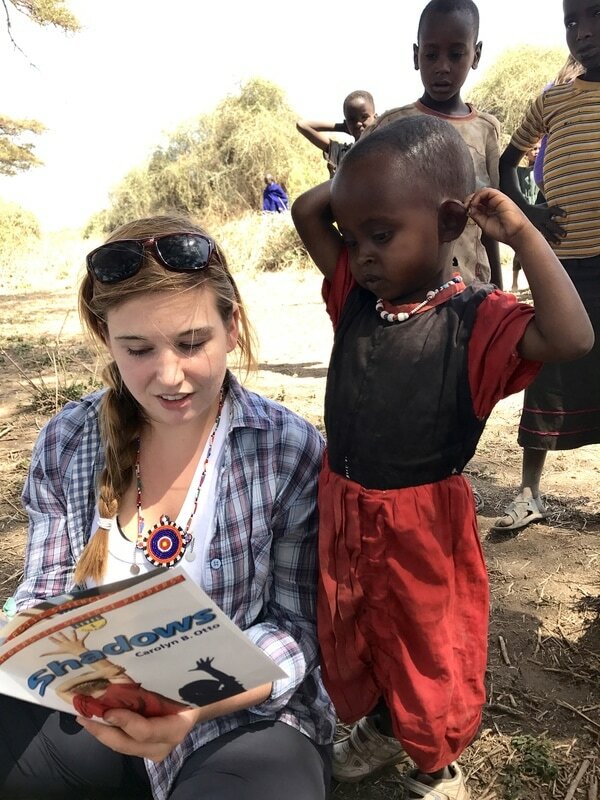 This way, she is learning to earn the things she wants in life, such as this scholarship, rather than just having them handed to her. Today was a day of many firsts for Lilian. 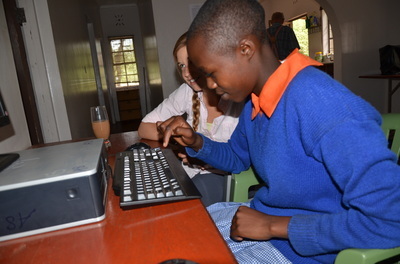 Here she is using a computer for the first time! She was so intrigued, watching the letters appear on the monitor as she pressed the keys on the keyboard. To many of us in America, a computer is just a common household commodity. To Lilian though, a computer is a very foreign and majestic thing. I also tried to explain the Internet to her. I showed her this travel blog and how I had posted about her on previous days. She was fascinated seeing her picture posted on the computer screen. While I was showing Lilian the Internet, one of the students at the college, Lucy, joined us. Lucy is a leader amongst the students at the college and serves as a role model for many. I’m glad that Lilian got a chance to speak with Lucy and hear some advice from a woman very much like herself. It was beautiful to watch these women connect over their struggles of the past, accomplishments of the present, and dreams of their futures. 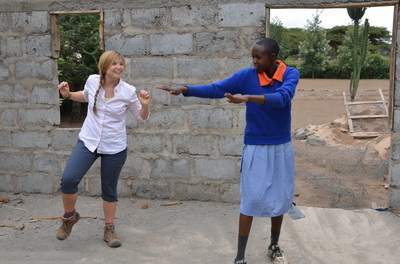 Lilian and I worked on choreographing dances together. We first connected when I came to dance with the children at her primary school, so this is something we really enjoy doing together. Today, I taught her the concept of “eight-counts” in music and explained how when you choreograph dances you string together the moves in counts of eight. This way, you stay with the beat of the music. She picked up on the concept very quickly and was eager to use the new knowledge as we danced together. 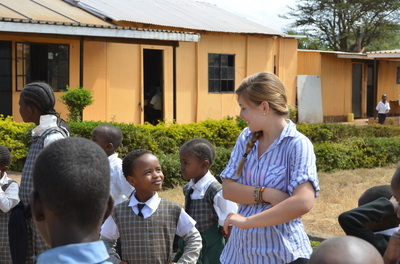 In the afternoon, we brought Lilian with us to the primary school that we went to yesterday with over 1,000 students. I had Lilian act as my assistant, helping me to organize the students and provide some sense of order. 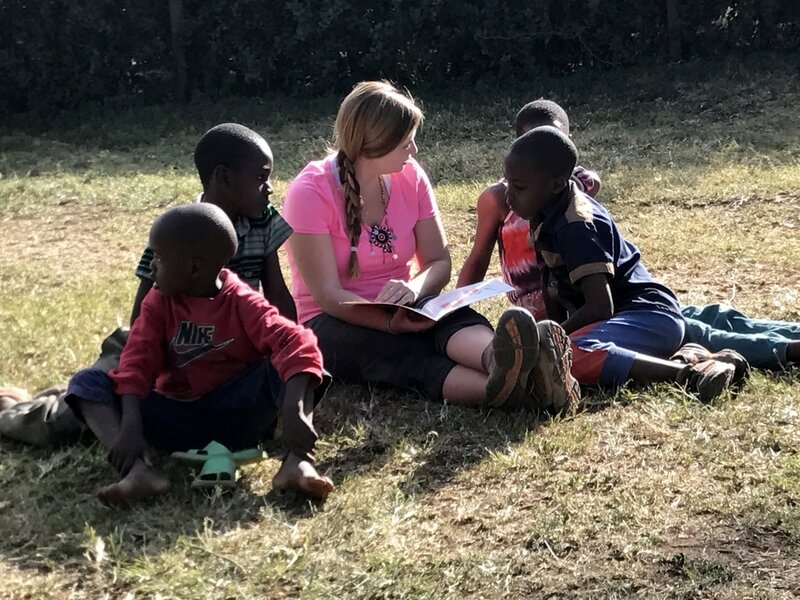 Though we tried our best, it was near impossible to control the children at this school. Nonetheless, it was important that Lilian gain experience in a leadership position. In the evening, we drove Lilian home and met her younger brother and her mother. 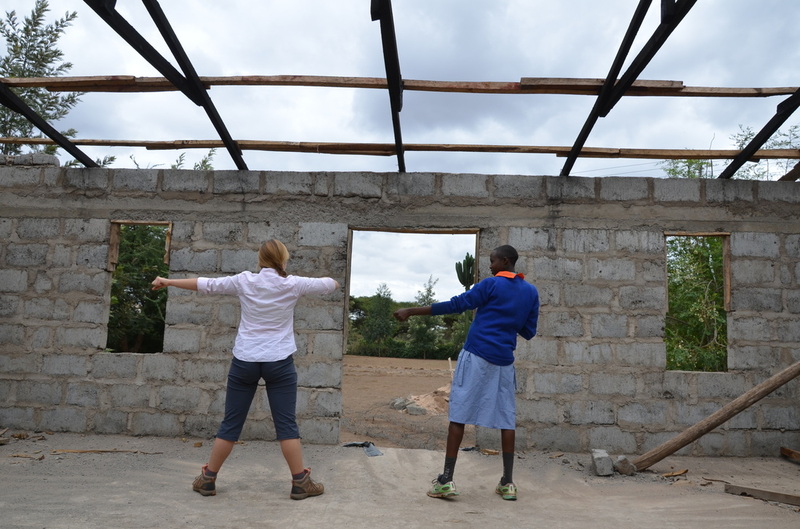 Lilian’s mother does not speak English but thankfully we had Joseph (a Masai friend of ours) to translate. We explained to Lilian’s mother the project we are going to embark on to fund her education. Hearing this, she was overwhelmed with joy and appreciation. 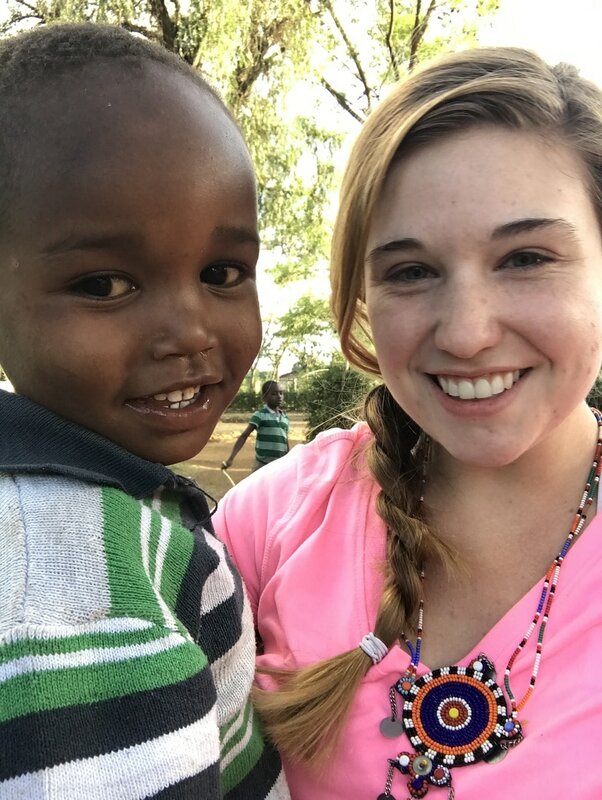 She grabbed my hands and spoke to me in Swahili, telling me “God will bless you” many times. 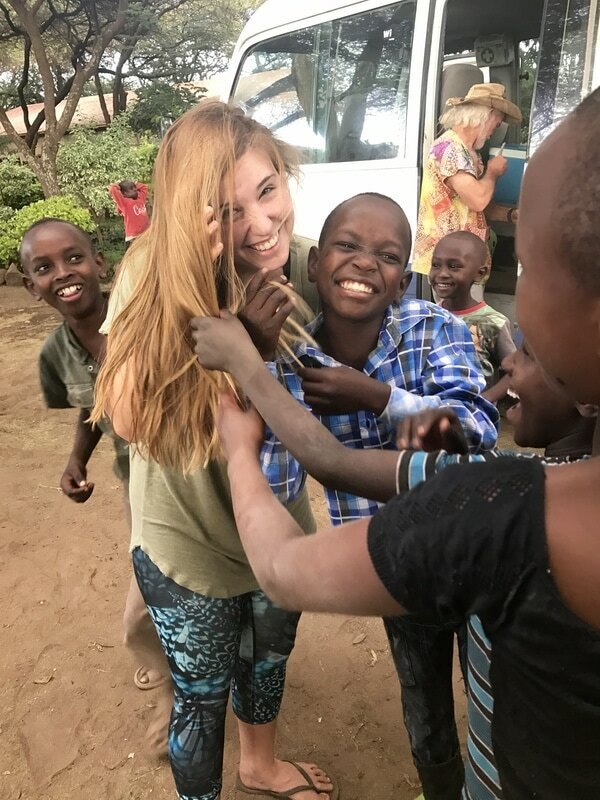 Words can’t capture how touching this moment was—standing in the front yard of a two-room shack in the middle of a field, feeling the grateful blessings from a family who had just received the priceless gift of hope. When I get back home, I will hit the ground running raising money for this special young girl. Lilian has touched my heart in an unforgettable way. I will keep in touch with her and see that she continues to grow as a strong leader in her community. Today we went to two primary schools in the Kimana area. 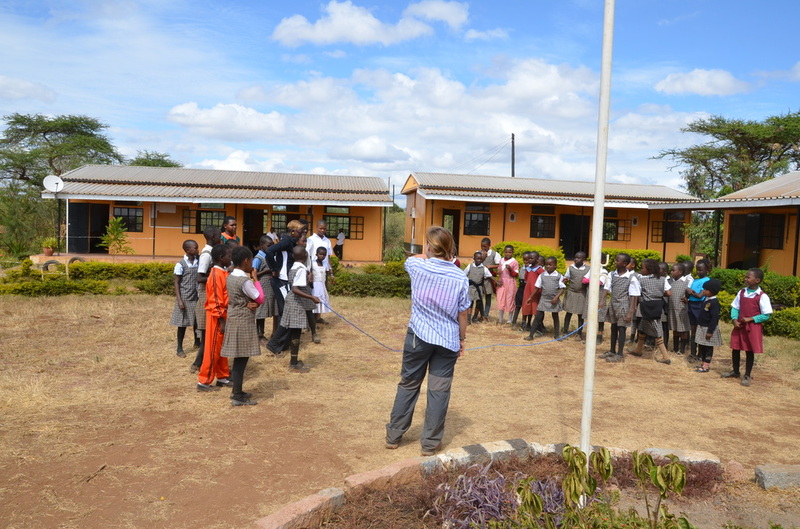 The first school we visited was a private school that had around 200 students. 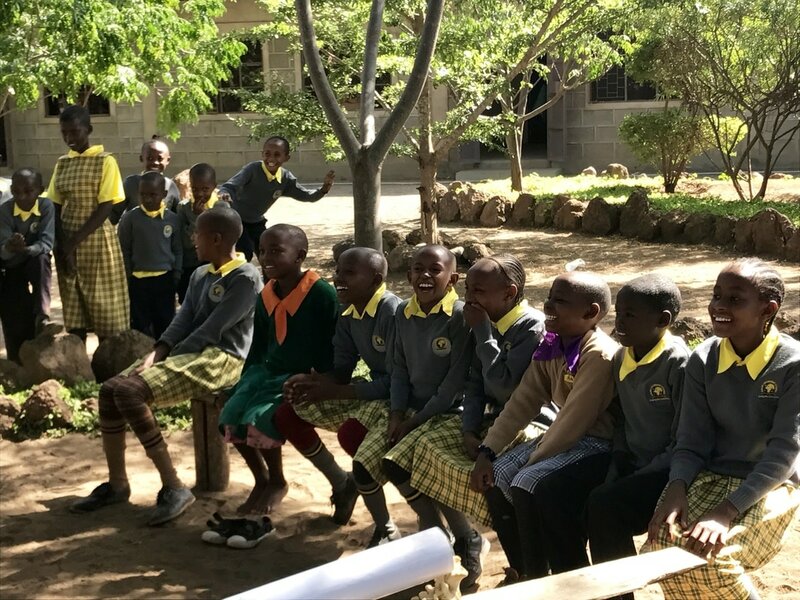 I noticed that the kids seemed more tame here and followed directions significantly better than students at some of the public schools we visited. We spent the morning dancing and playing jump rope. I mostly was working with students ages 6-10, but there were some older and some younger than this. While I was busy with the girls, my dad was teaching the boys how to play baseball. In the afternoon we went to a public school with over 1,000 students. I found it a little overwhelming to be amongst so many children, especially when they are all curiously grabbing and pawing at my skin. They had a fascination with my hair again, as many of them had never seen long, blonde hair. Many of them told me “you are smart”, which I later found out is how they often compliment “mzungos” (white people). At this school, I helped my dad teach baseball to the 8th graders. Watching my dad explain the logistics of the game, it occurred to me how foreign this sport was to the Kenyan children. I tried to put myself in their shoes as they were viewing the baseball diamond and hearing the different terminology for the first time. If I were one of them, I would have found all this new information overwhelming and very confusing! Nonetheless, the students listened intently as my dad explained how the game works. When we got out on to the field, it was chaos. There were about 50 kids in the 8th grade class and another 80-100 students that were observing. Trying to organize the students was incredibly difficult, but we did the best we could to instill some order in the process. 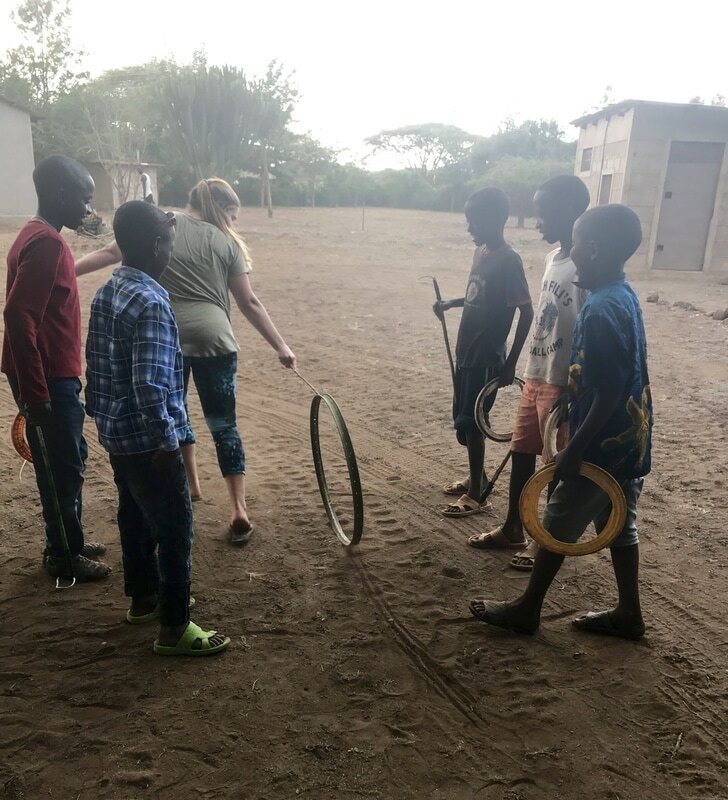 Once we had some sort of line formed and positions assigned out in the field, the students were able to have their first experience playing baseball! Before we left, we passed out balloons to a handful of the students. 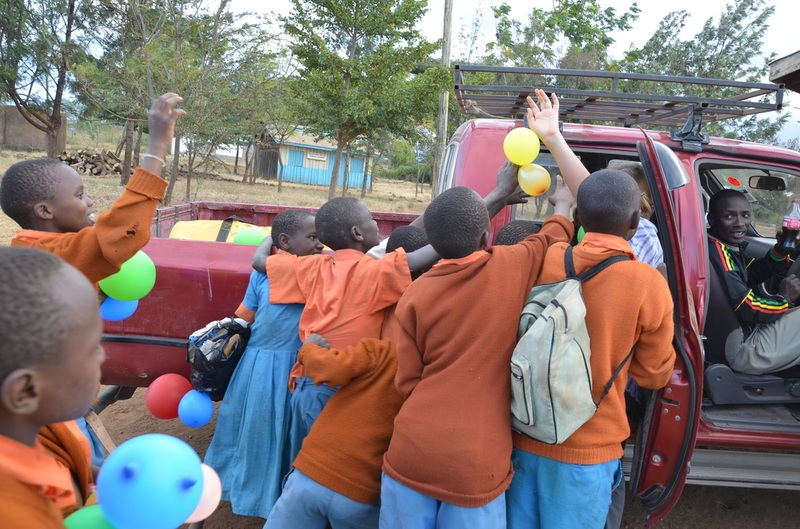 Once other kids saw the bright colored balloons being distributed, there was a stampede of them headed towards our truck. Tiny fingers reached towards me, desperately trying to grab a little piece of joy. To them, a balloon is the greatest thing in the world. I think about an American child who would play with a balloon for a couple minutes, get bored with it, and go on to play with their motorized car or flashy Barbie doll. Seeing the children get so much enjoyment out of a gesture so small really put things in to perspective and made me appreciate how fortunate I have been throughout life.